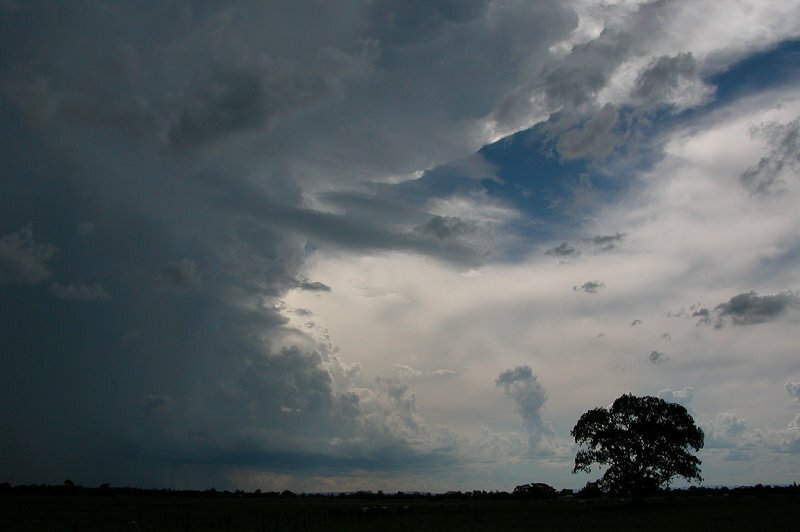 For the previous three days of storm activity, check out part 1 of the nine day outbreak. 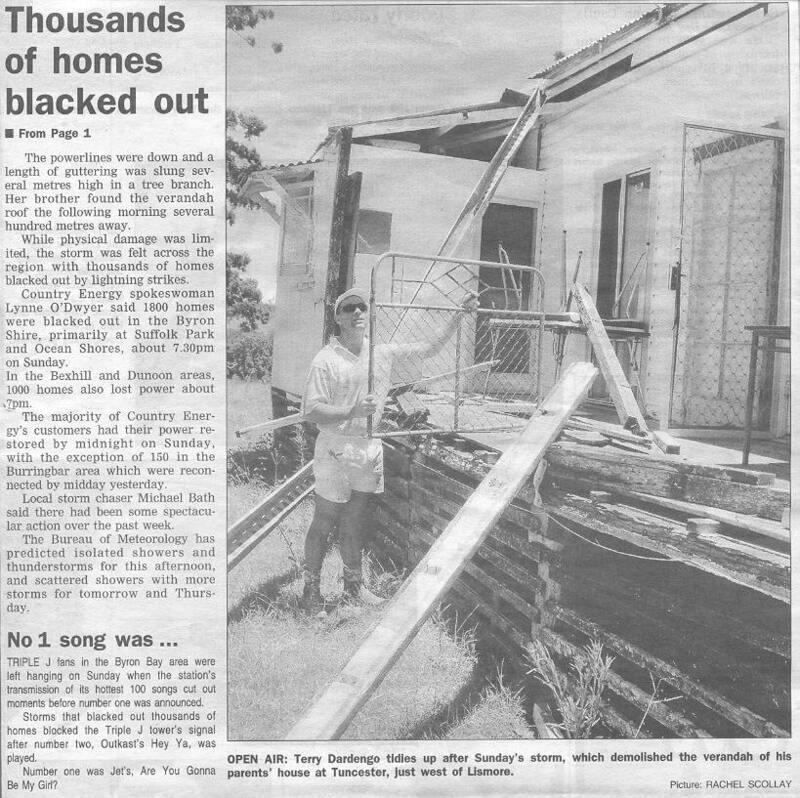 Shear once again wasn't favourable this day. While upper winds were strong, weak SE winds were present in the low levels. 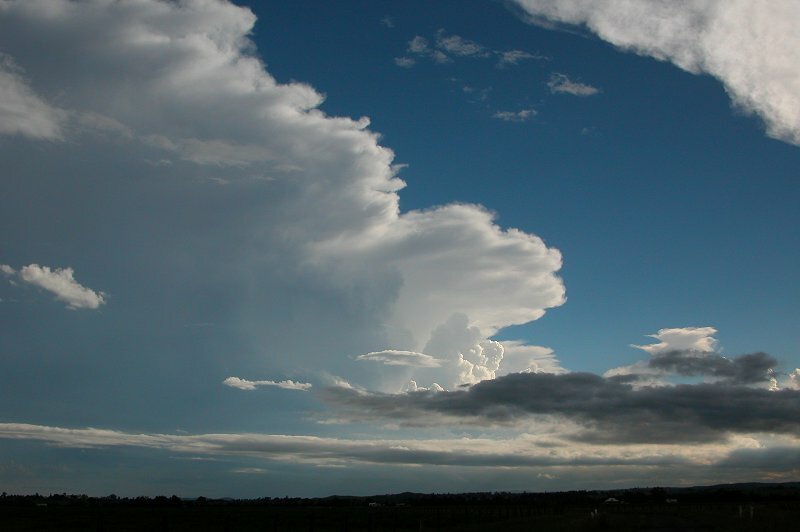 Moisture had increased in the mid and upper levels from the previous day and the temperature profile showed that capping would keep activity suppressed till later in the afternoon. LIs were forecast at around -4 in the costal regions of the Northern Rivers. 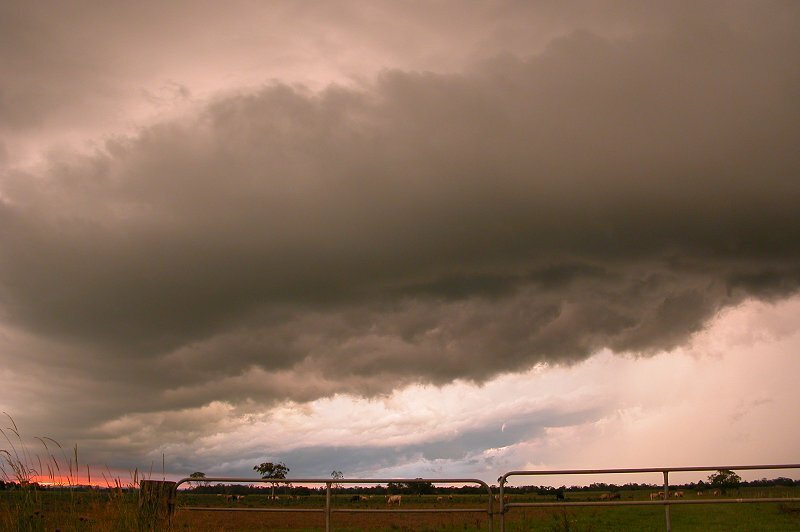 So once again severe storms looked possible. 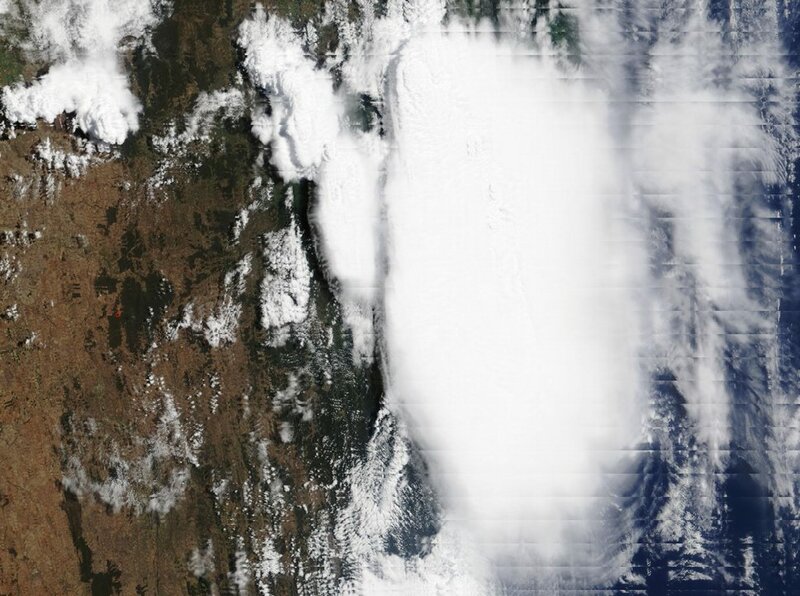 One great concern though was a whole lot of high cloud developing in S QLD/N NSW that was moving over the area. By 1pm nearly the whole sky was covered in cloud, however the temperature still passed the 30C mark without too much trouble. 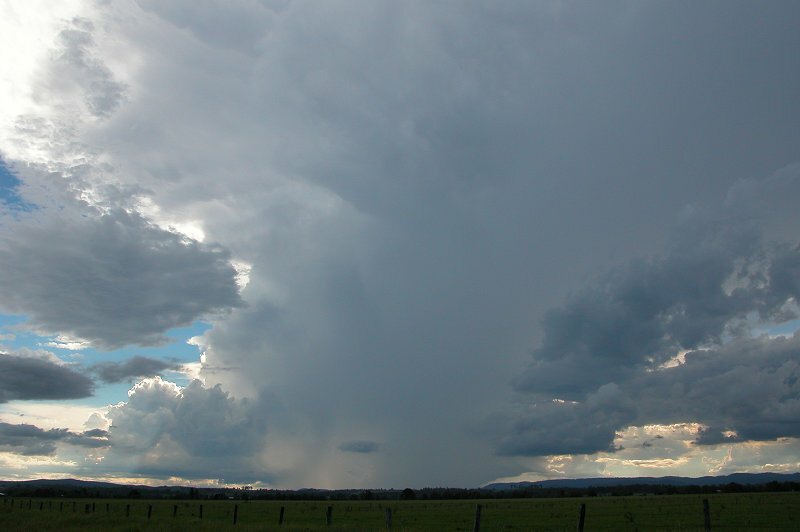 There was weak convection along the ranges to the W and SW for most of the afternoon, but a cell west of Casino started taking off at around 3pm. No one else was available to chase so I set off towards Casino. 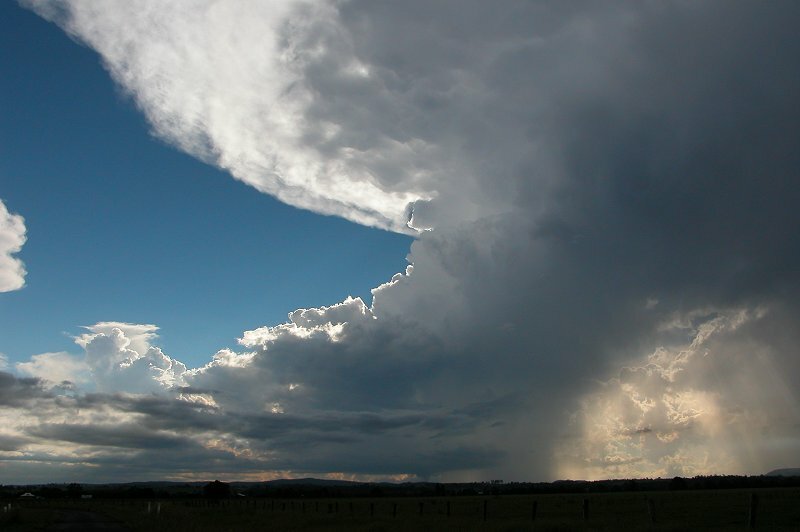 I stopped just east of Casino in Fig Tree Lane at around 3.50pm and watched the cell as it gave nice strong updrafts and produced a beautiful crisp anvil. 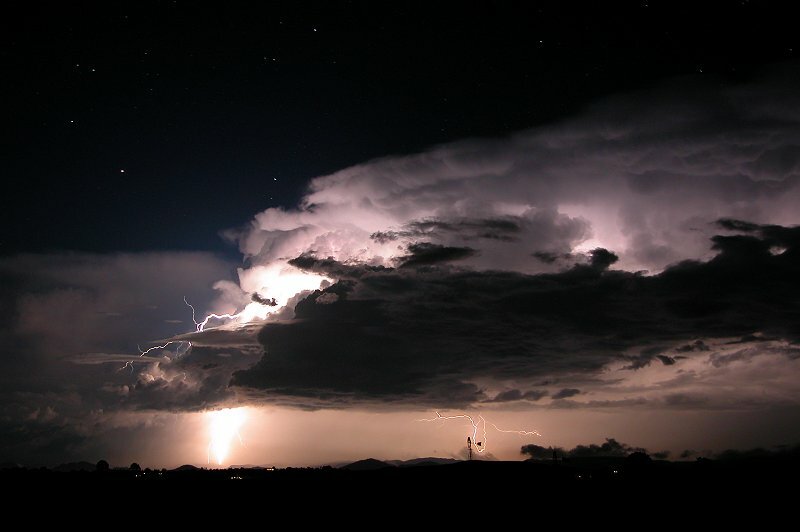 Thunder was almost constant and a number of CGs were spotted. 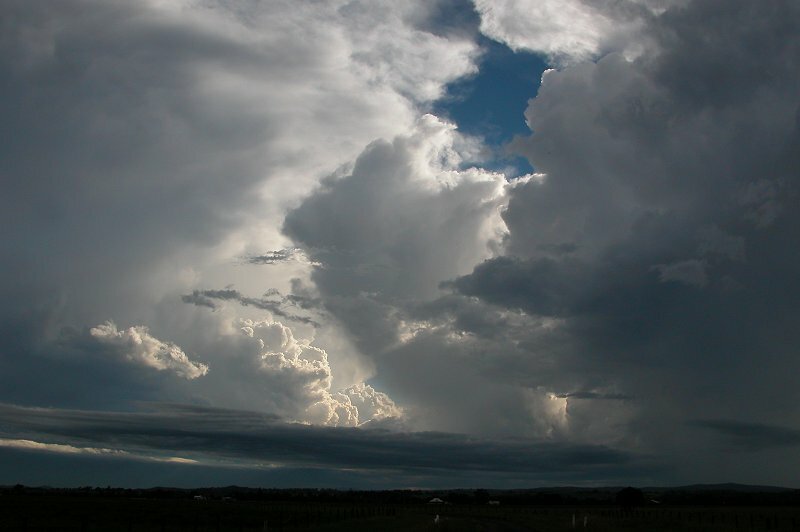 Cells to the south also looked quite solid and I hoped these would move up to the area later in the afternoon. I was still unsure of what direction the cell was heading and after a radar update discovered it was heading generally east. 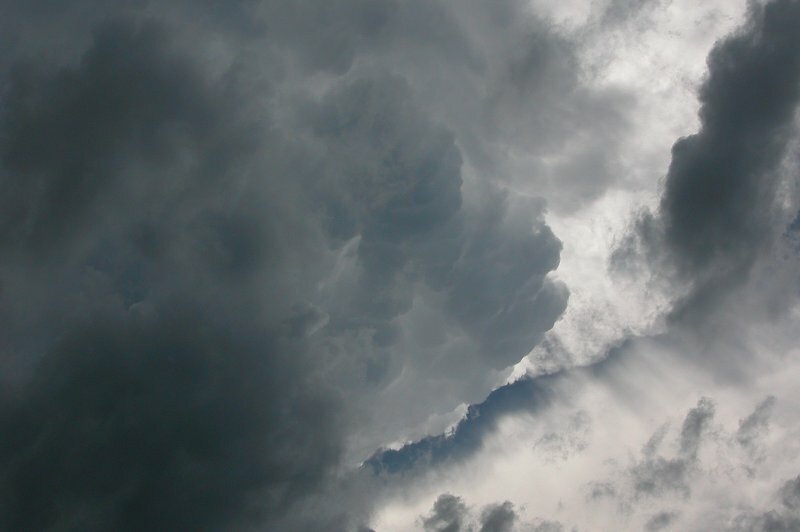 More strong updrafts pushed out and gave some nice knuckles/mammatus under the anvil. There was a lack of base features which was a little disappointing, but it certainly had a nice updraft region. At 4.12pm I decided to head towards Casino to get a little closer to the cell. I stopped at one point for a photo as the cell had a nice rainfoot, however this eventually weakened as I got closer to Casino. 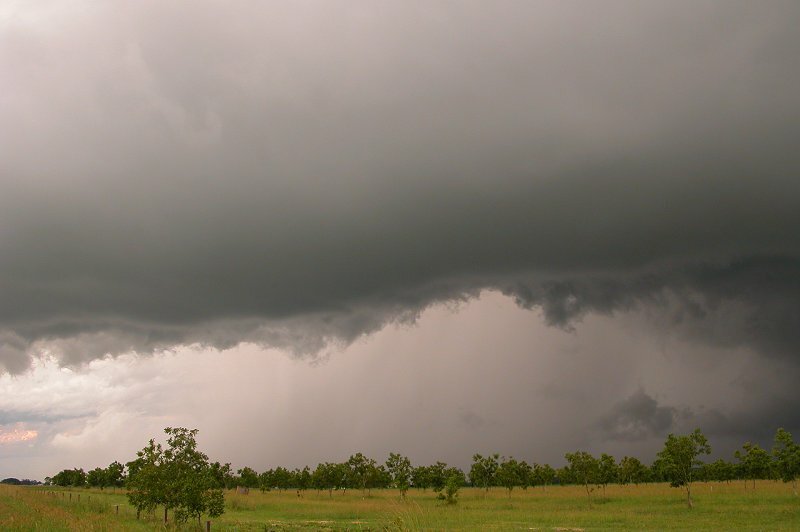 I stopped on the western outskirt of Casino to observe the precipitation curtain to my S. Some occasional CGs were spotted, but not many. 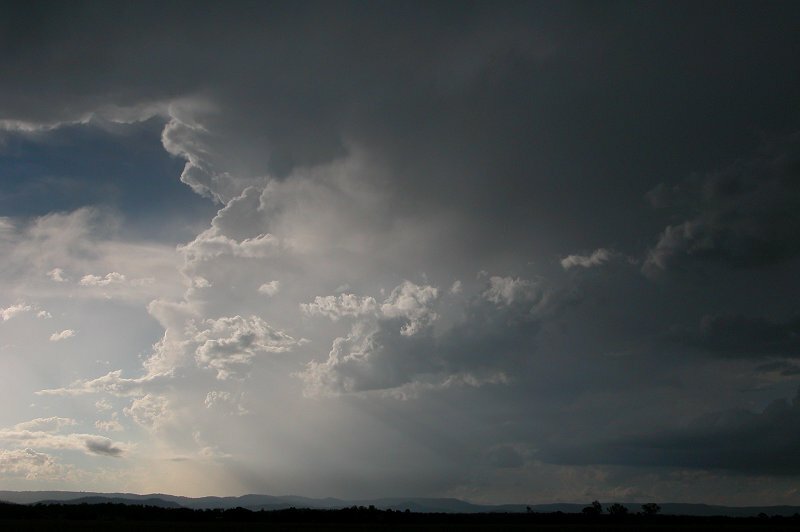 It looked as though the cell was weakening and more convection was going up WNW of this cell. 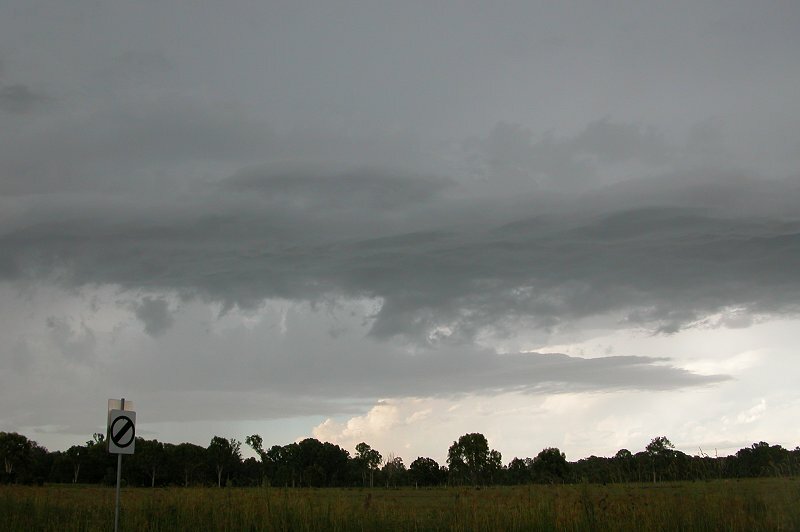 CGs started dropping out of an updraft region W of me and looked like it was going to continue to extend further WNW. I made the decision to head up the Summerland Way to try and stay NW of the cells. Stopping just N of Casino at 4.50pm it appeared a number of weak cells had developed and everything was looking pretty disorganised. 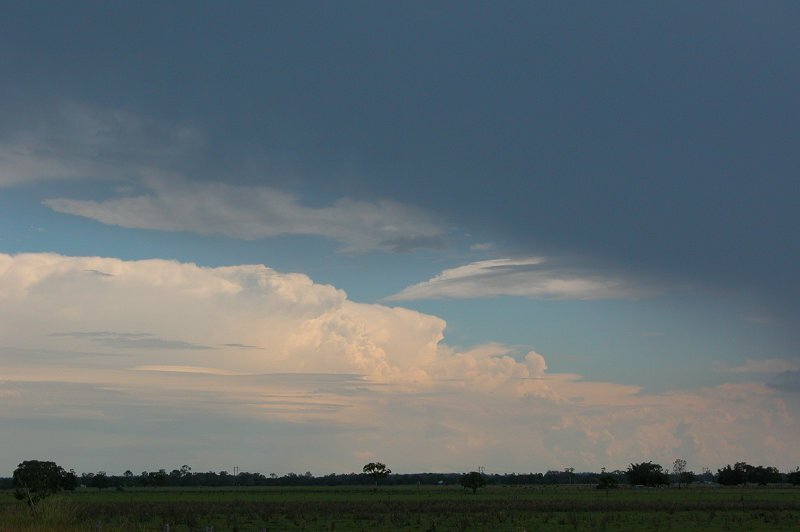 Still, a nice updraft region existed to my SW and I watched this grow larger and produce some CGs. 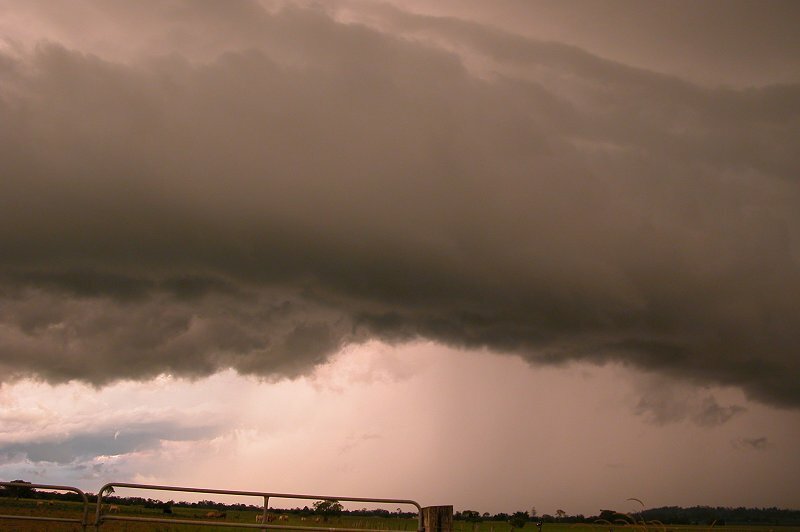 I also watched a strong looking storm in S QLD which looked quite impressive! I headed about 15km N of Casino and stopped at 5.05pm. Once again everything was looking pretty featureless. I sat and watched the activity to my SW move slowly ENE, giving off occasional CGs, with one dropping within a few kms of me! 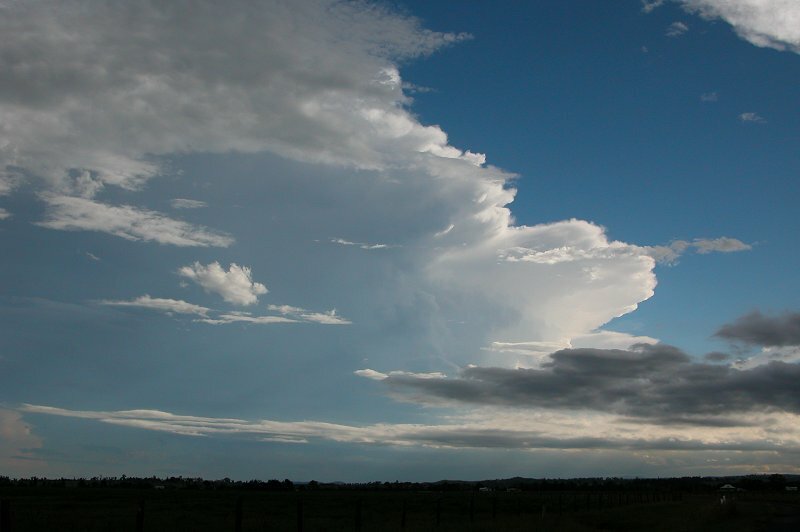 The anvil from the activity was spreading a long way to the east. 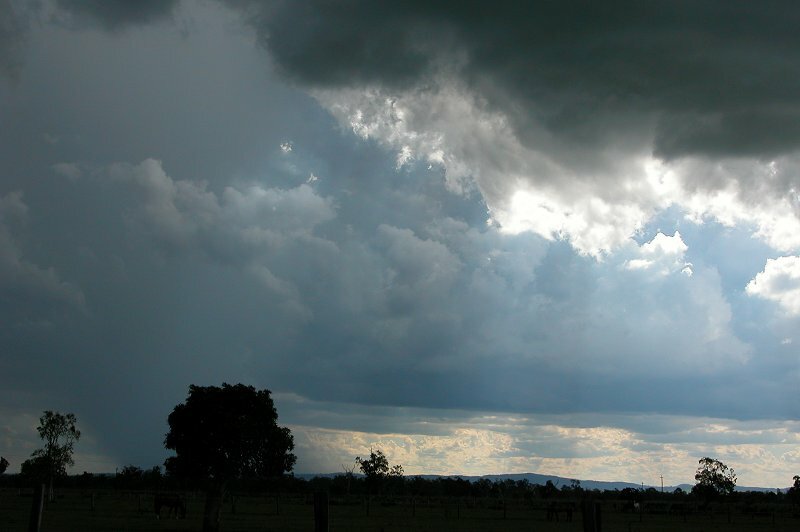 Eventually at 5.25pm I decided to head for Casino and try and intercept the storm, hoping for some hail! 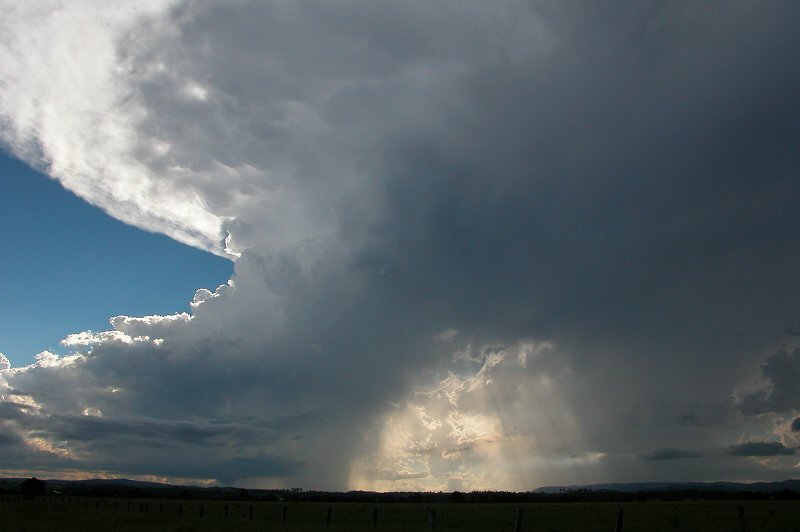 On the drive back, some nice updrafts were observed at the back of the cell and the rainshaft was well illuminated by the sun. 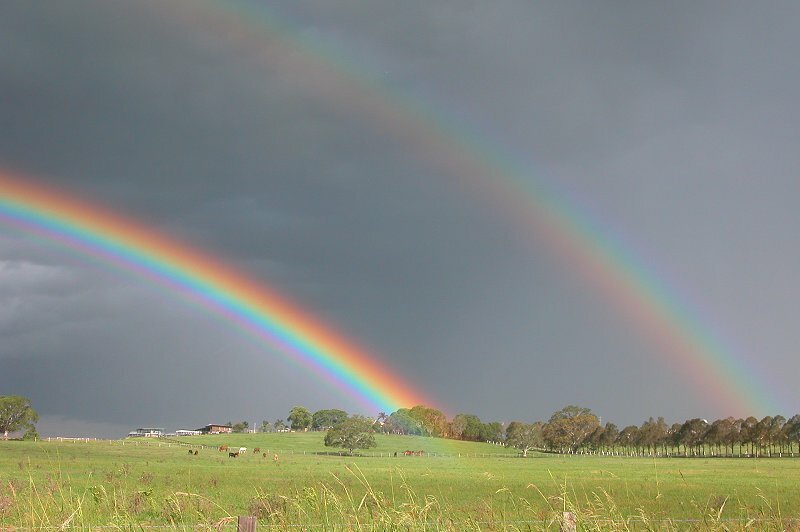 As I got closer and started getting some light rain, a very intense rainbow became visible east of me. It was too good to pass up so I pulled over and got a photo. Just after taking a couple of photos a flang hit in the paddock I was photographing, scaring me and the wildlife!!! I dove back in the car and proceeded onto Casino. Basically I encountered heavy rain the entire trip back home. 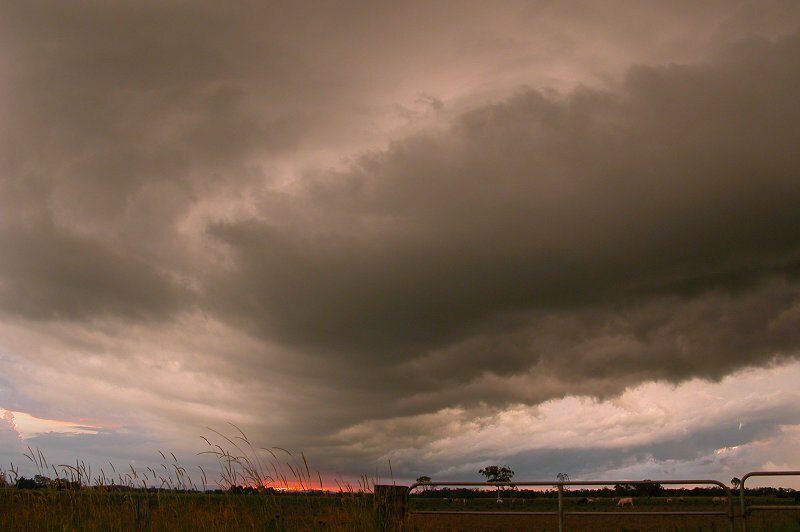 Gusty winds were experienced just N of Casino once I got into the cell, and borderline severe winds were encountered between Lismore and Casino, which whipped up some dust and turned the sky an eerie brown colour. 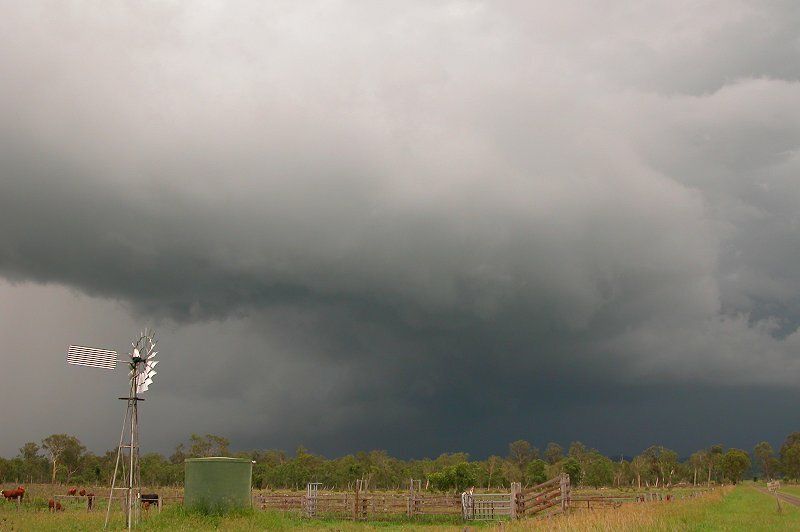 Tuncester, which is west of Lismore, experienced damage to roofing from this storm. 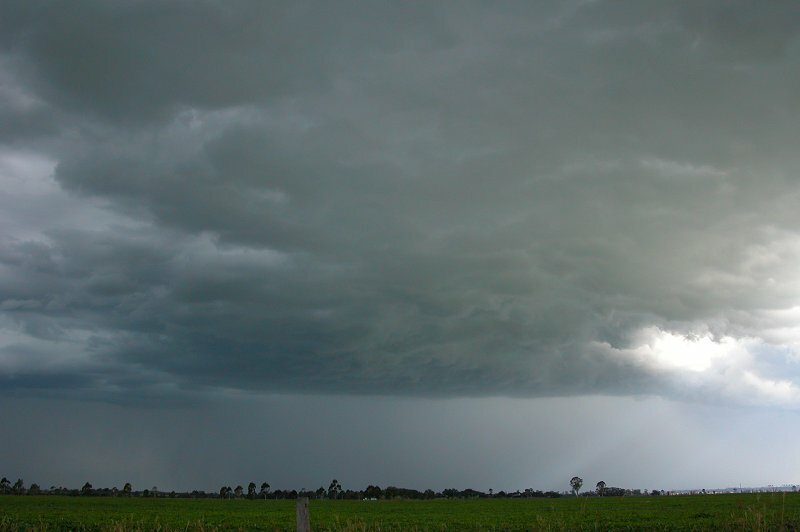 As I reached Parrots Nest a nice gustfront appeared from the south. It was quite frustrating as it was all starting to collapse as it collided with a mess of activity around it. 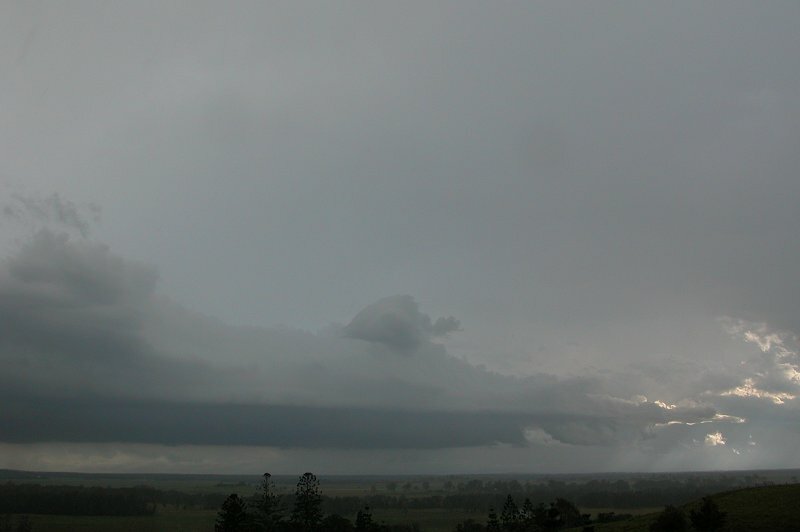 I still managed to get one photo of the end of the gustfront before heading into Lismore. 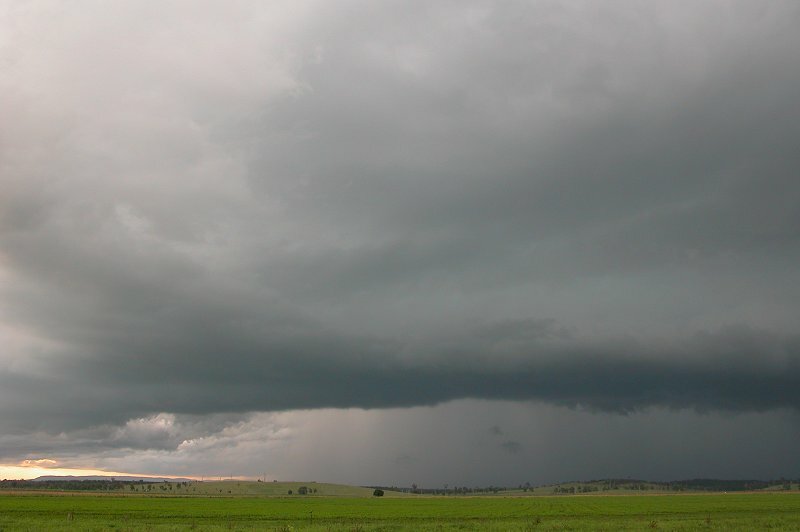 Near the Lismore Airport I received a few small hailstones along with further very heavy rainfall. The gutters were overflowing throughout Lismore and water was covering parts of some of the roads. 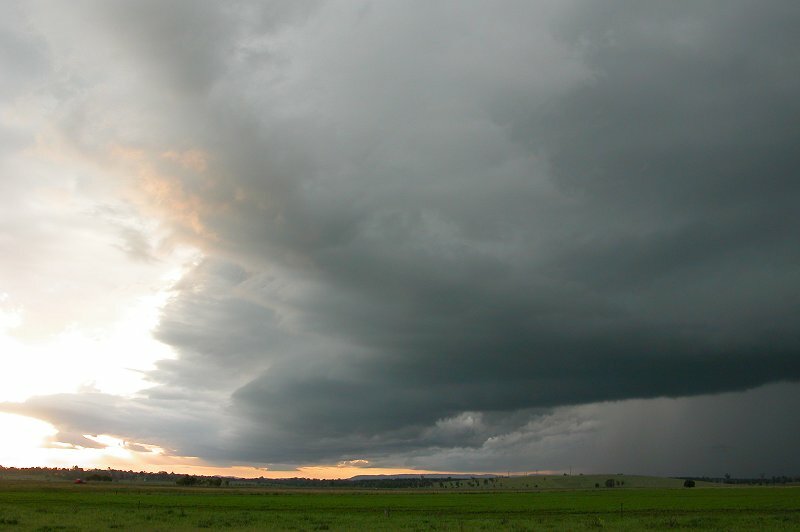 The cell seemed to get organised somewhere between Casino and Lismore, producing a nice shelf cloud observed by Michael Bath from his home, and then proceeding NE up the coast and presenting HP Supercell features to Anthony Cornelius and Jason Rainforest who intercepted the cell at Pottsville. You can read their report here. 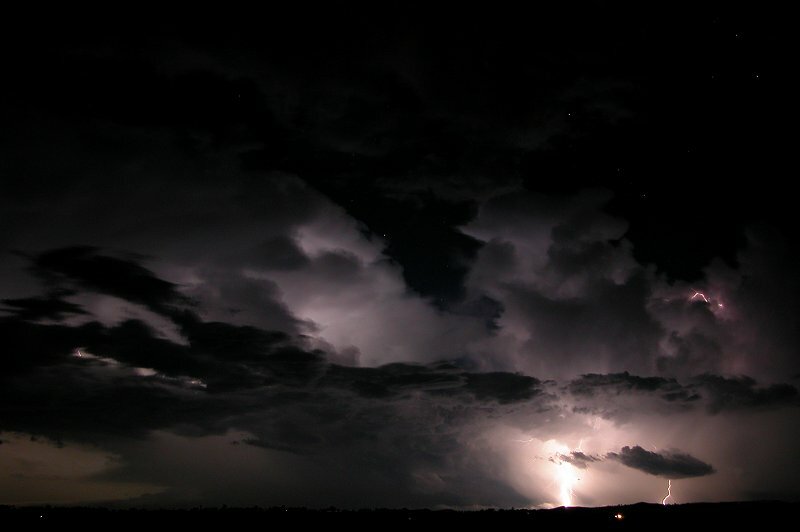 Further weak activity formed into the evening giving infrequent lightning. 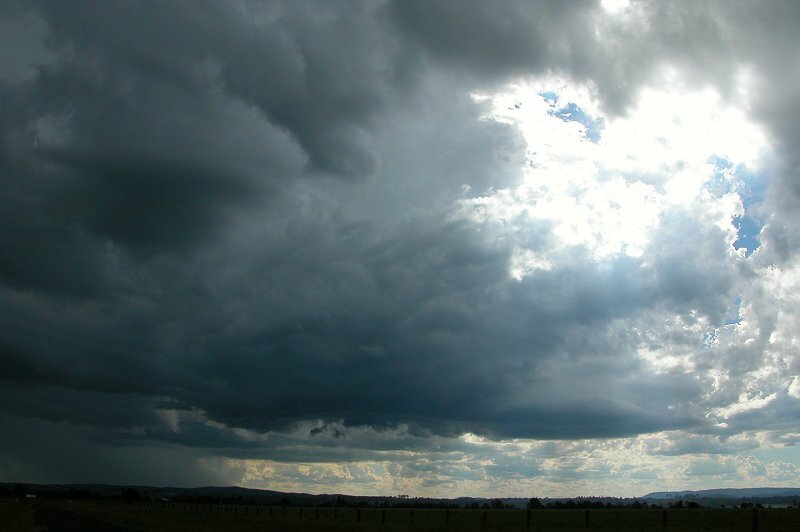 A dryline was sitting along the Northern Tablelands and the atmosphere looked set to go off when looking at the models. 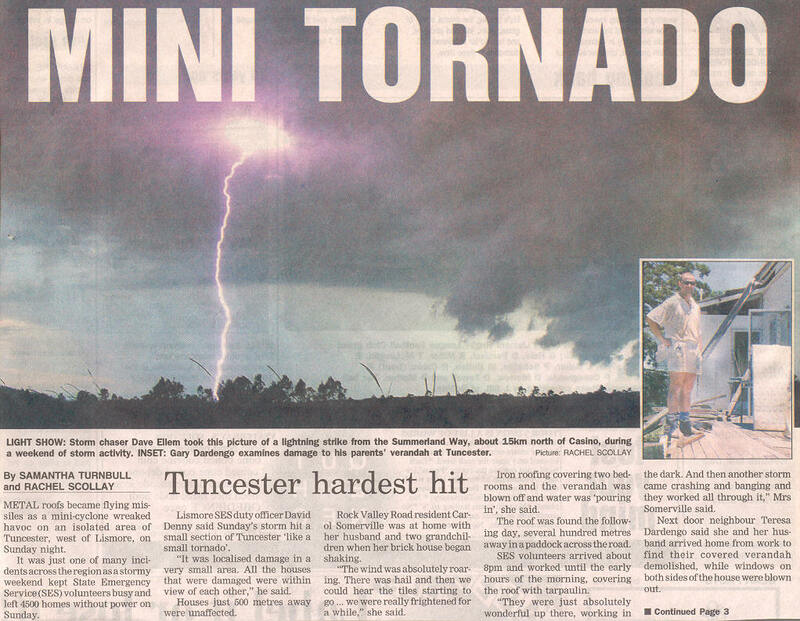 LIs of -4 and CAPE over 2000, almost 180 degree turning of the winds, a strong cap, a moist low level atmosphere and very dry mid and upper level atmosphere had both chasers and the Bureau expecting severe storms, with large hail and strong winds very likely. While it looked like a coastal supercell setup, the one thing that hadn't been taken much into account by chasers was that winds swung from E on the surface to W in the upper levels in a clockwise direction. We were later to discover the E/SE winds near the surface would help stabilise the coastal areas, keeping activity inland. 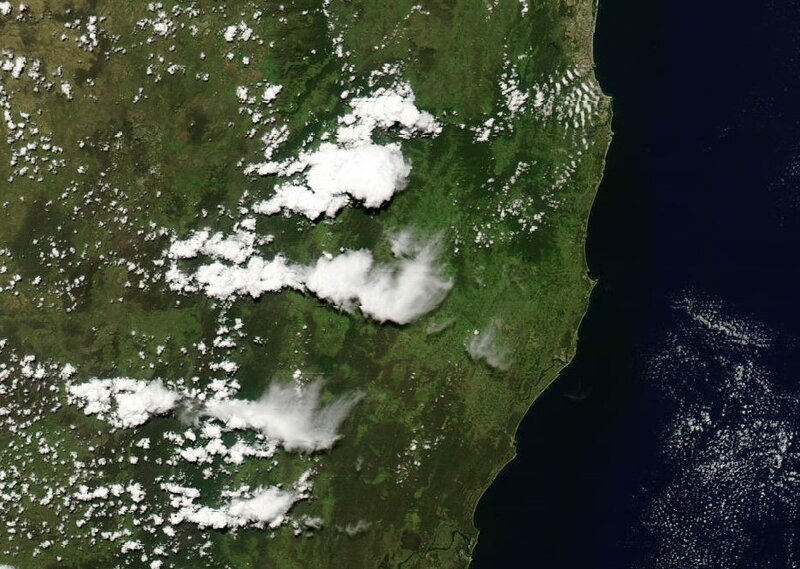 At 2.30pm rapid development took off along the ranges to the west - surprising me not only because it was so dry where they were developing, but they had managed to break the cap earlier than expected! Michael Bath and I stopped at Fig Tree Lane, east of Casino at 2.50pm, also meeting up with Rodney Wallbridge. 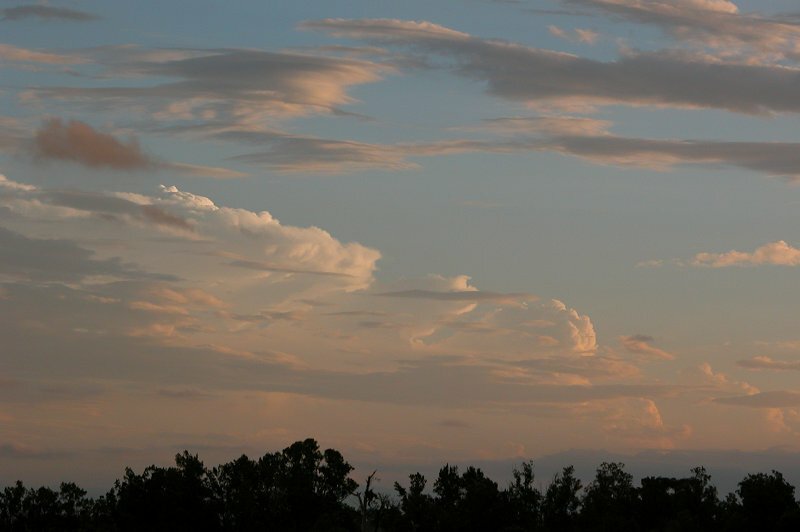 Several storms were developing from the SW through to the NW, however all looked moisture starved and were much lower topped than the previous few days. This was a little bit unexpected given upper temps had cooled slightly. 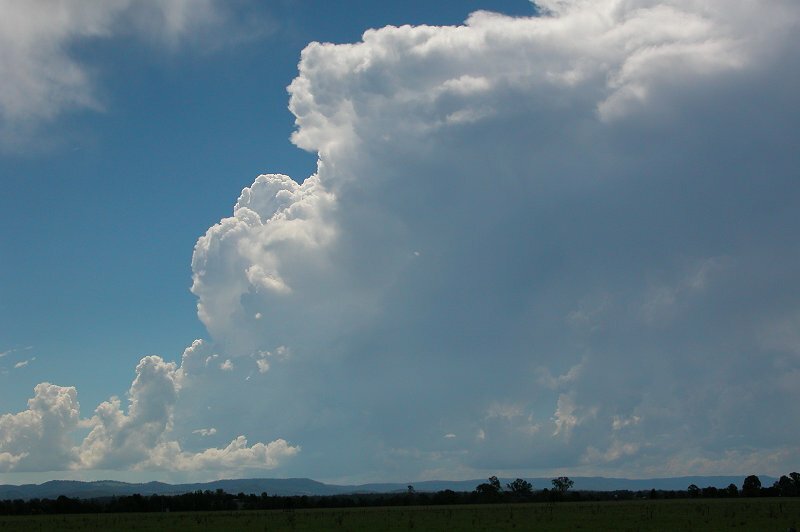 We continued to watch a stronger looking cell WNW of Casino and headed just N of Casino to watch as it put up a number of nice crisp updrafts. 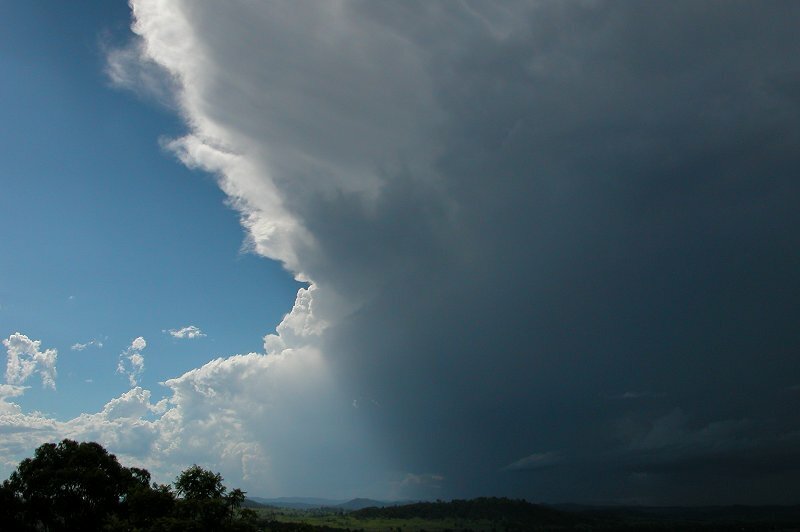 This cell was the first to look like it had a decent base on it, so we headed a little closer. 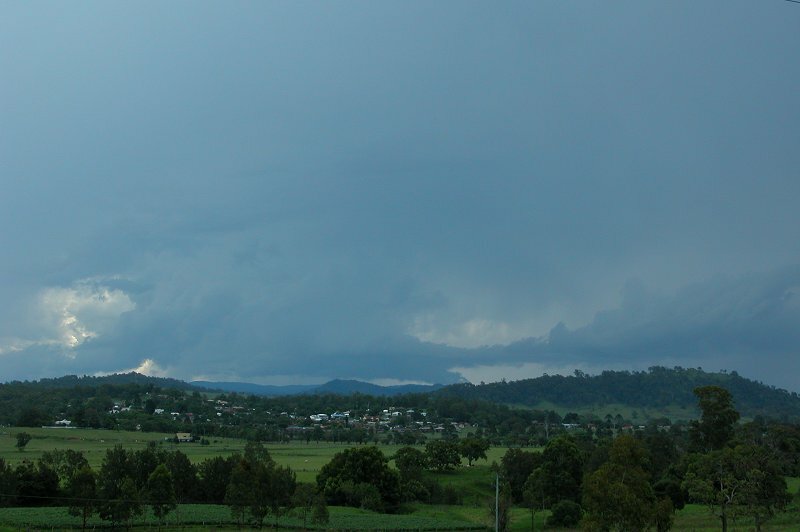 At 3.40pm we arrived in Kyogle. 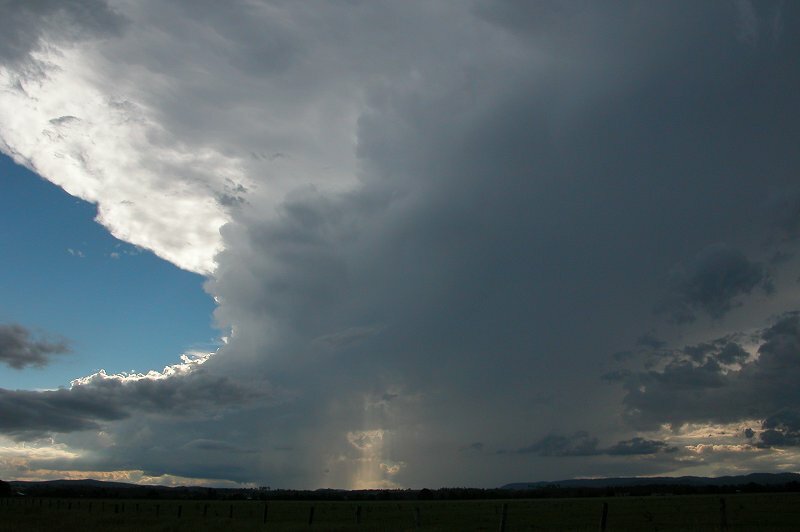 The cell, heading NE towards QLD, looked better organised, but still lacking moisture. 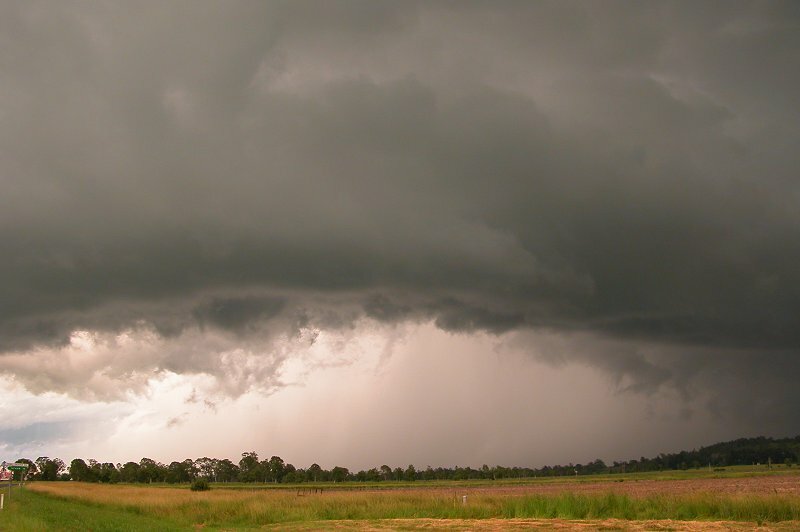 It looked for a short while like it was developing some supercell features, however these soon disappeared. 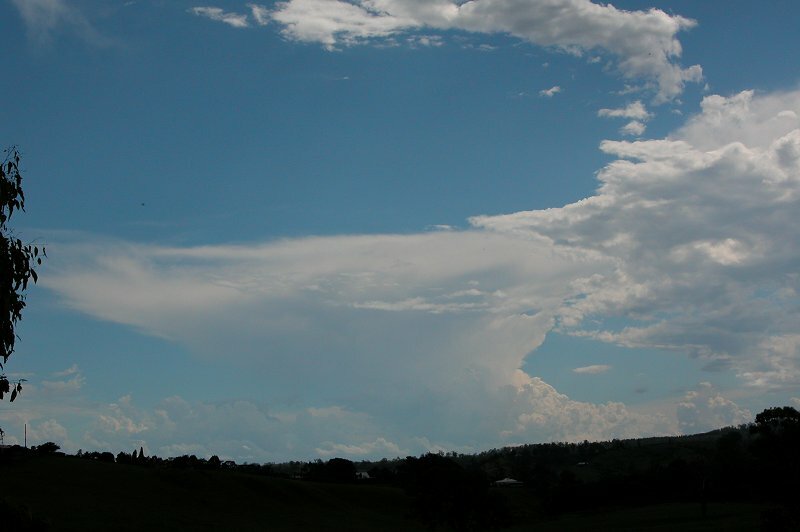 The anvil sure looked impressive though, and was pushing much higher than earlier. 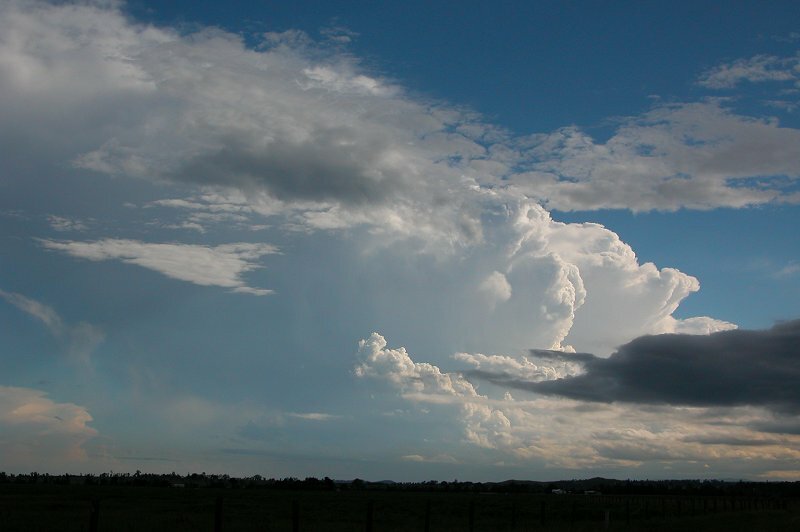 More convection was developing W of Casino, but was still looking dry/weak. At 3.55pm we decided to try and find a proper lookout (we were sitting on the side of a main road earlier) and found a lookout with great views of the NW and views from the S around to the NE. We sat in terrible heat for about 10 mins before deciding to head back to Casino. This storm wasn't going to do anything for us now, so we figured we either find storms further south or head home! 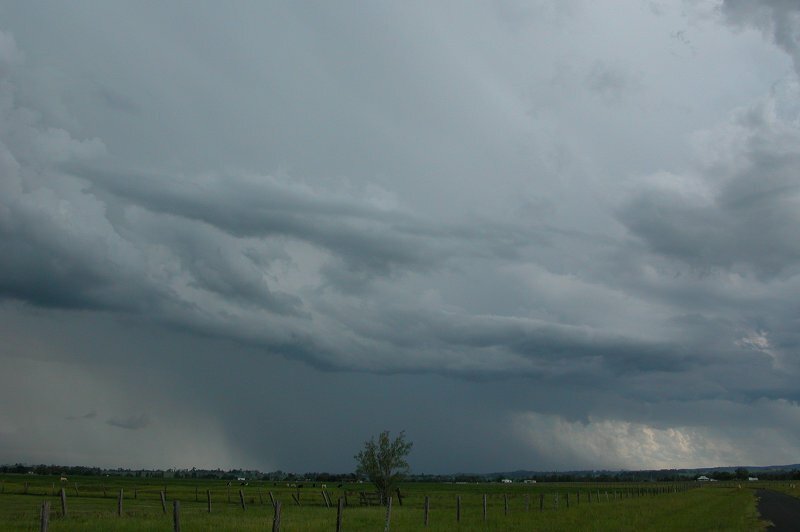 The cell to our NW developed into a supercell across the border and was pursued by Anthony - his chase report is here. 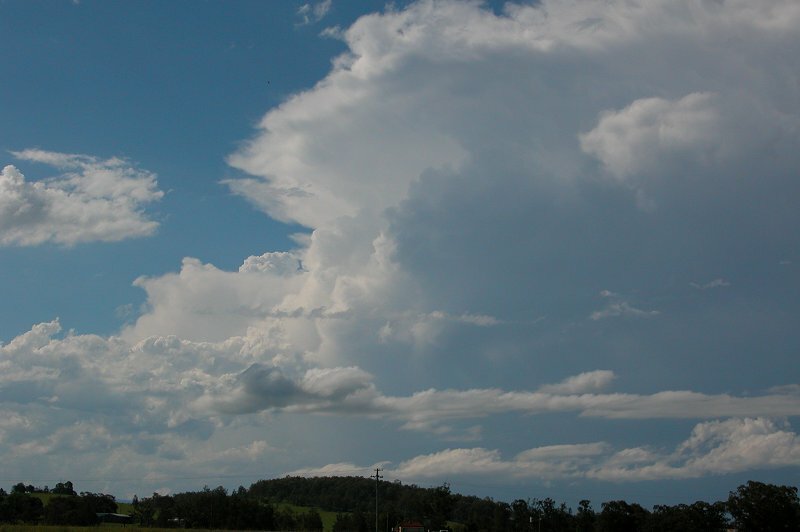 Between Kyogle and Casino we stopped to observe the cell to our NW and some updrafts to our west. 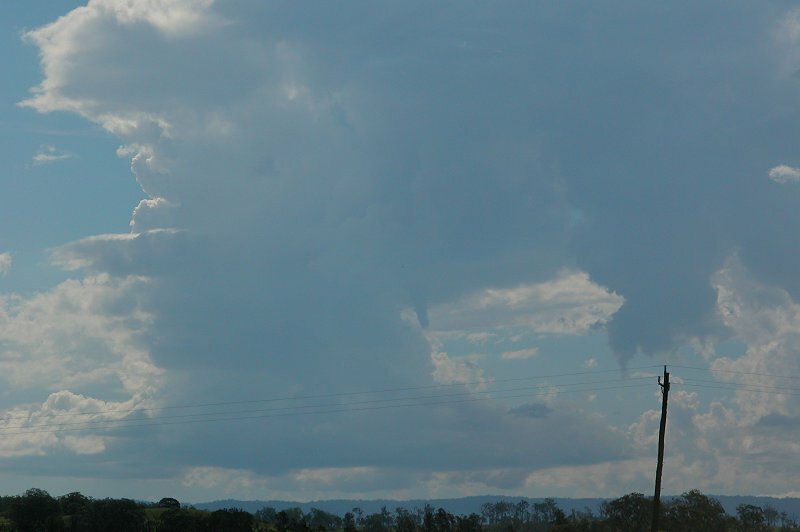 What looked like a mid level funnel popped out of the messy updraft to our west. 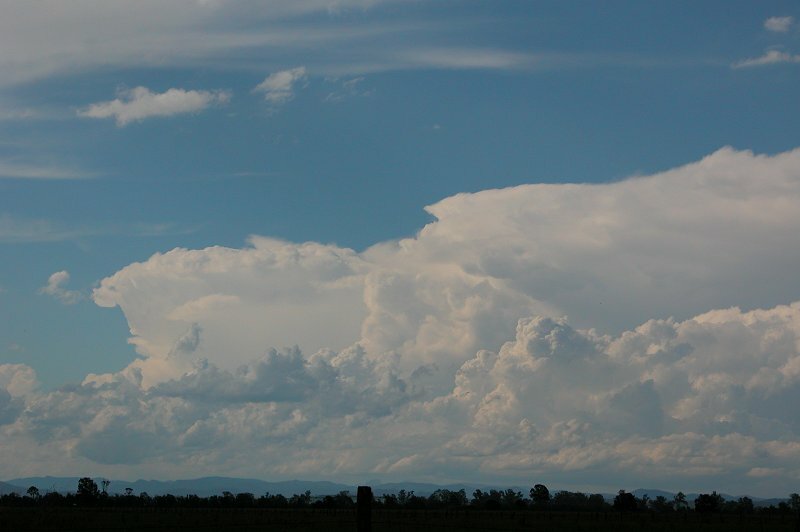 There was further messy convection west of Casino. 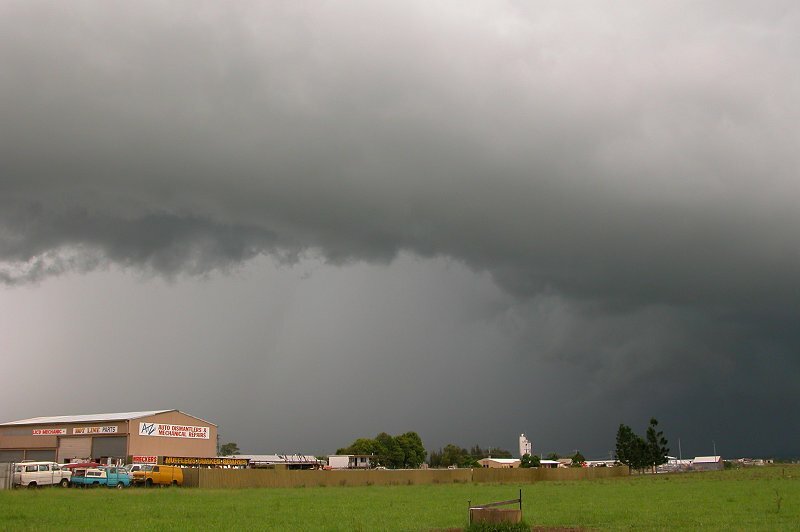 We concluded that the storms needed some "Mactime" (the time in which chasers stop at Maccas for some refueling and storms get themselves organised). 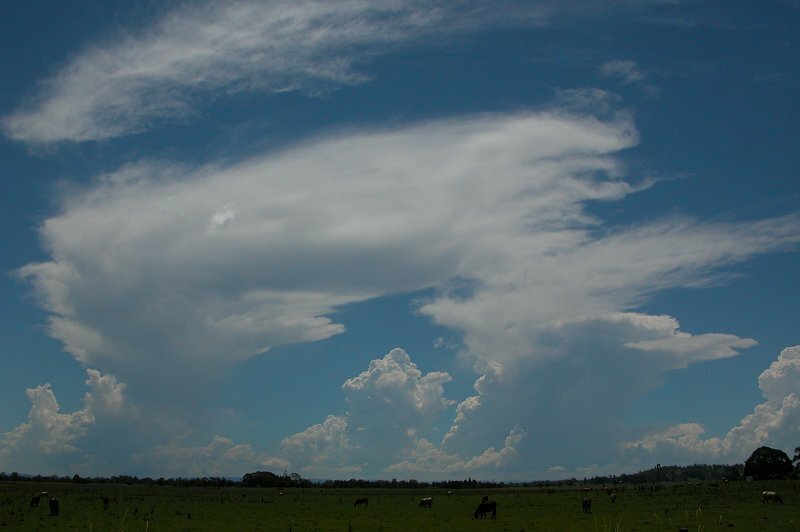 After 30 minutes of "Mactime" we came out to explosive updrafts to our SW, and the weak convection to our W which we had glanced at in hope before stopping at Maccas now had a solid anvil with solid updrafts and a possible wall cloud region on it�s N flank as well! We arrived at our regular little spot just N of Casino at 5.20pm. For the next 40 minutes we watched the cell to our SW continue to grow, while the storm to our west gave us a the perfect opportunity to observe a splitting pair of storms, one heading NE and the other SE! 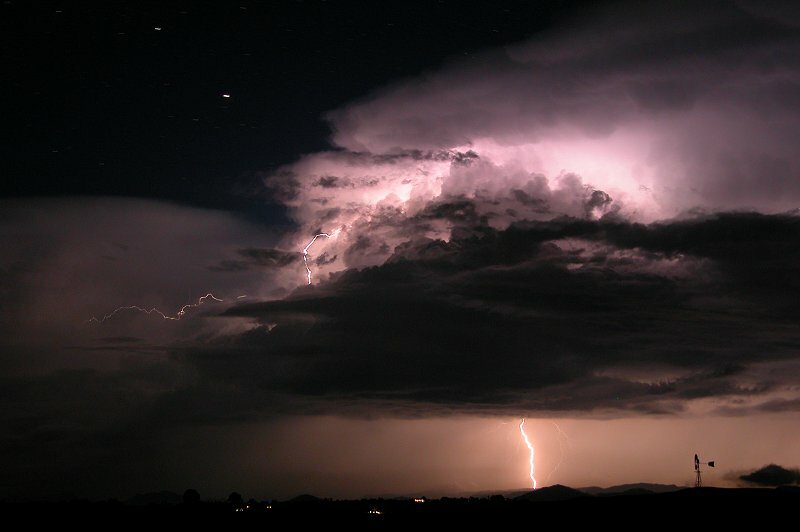 Unbelievable CG bolts were jumping way out of the storms into clear air from anvil. 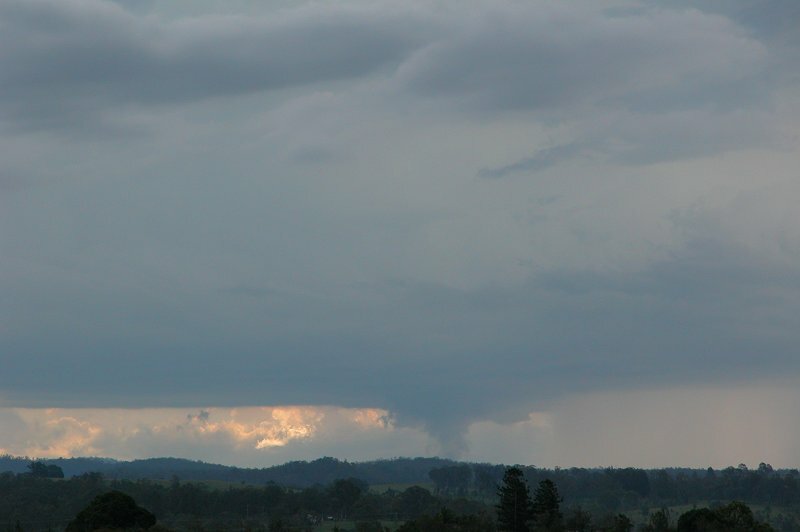 At 5.45 pm a scuddy lowering developed under the base of the right mover. It didn't last much longer than a minute, but sure caught our attention. 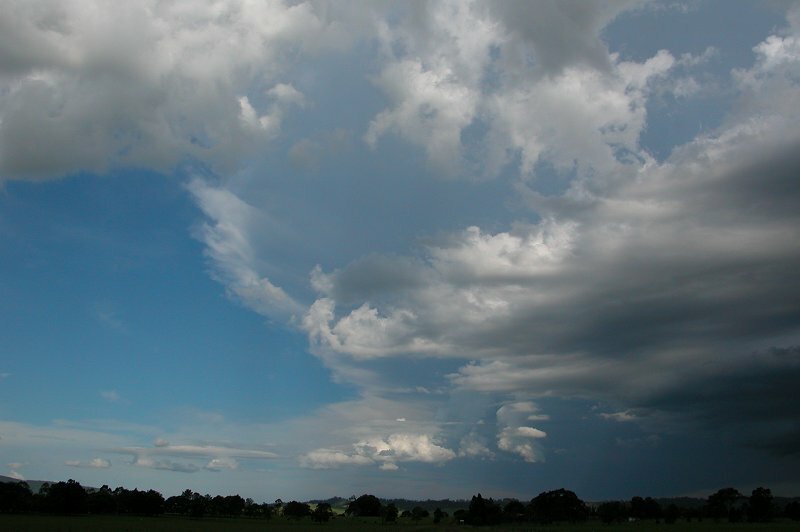 The cell continued SE and began to interact with the cell to our SW which was advancing NE - the result was that both collapsed.The updrafts on the back of the left mover were now visible. At 6.05pm we headed S along the Summerland Way before turning off at Rappville to observe the dying stages of the cell. 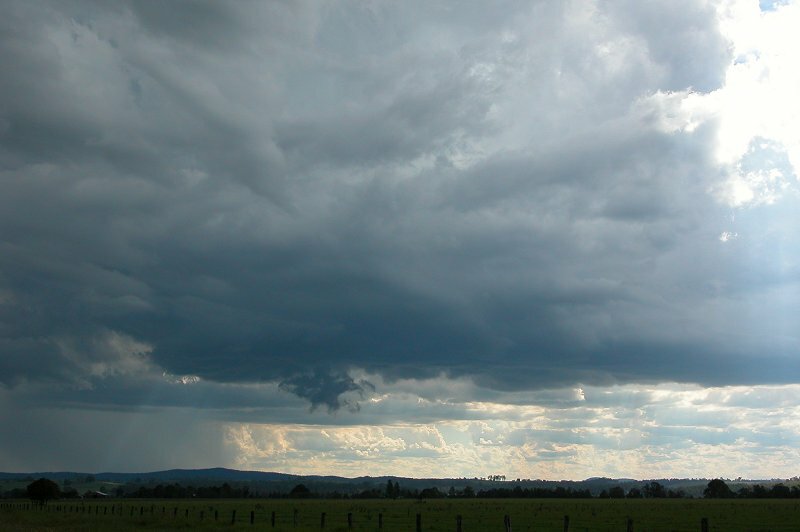 We then returned to Casino to watch a weak cell that had developed along the Richmond Ranges to our west. It didn't do much so we called it a day and went home! 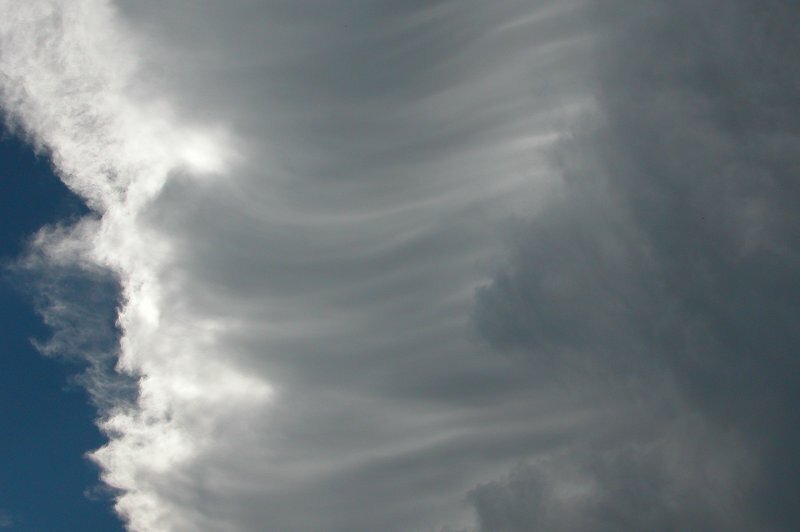 A small strip of instability was still present over the Northern Rivers - with LIs reaching -6 near the coast. Shear had changed again from the day before, with moderate shear at all levels, maybe a little slack in the upper levels. 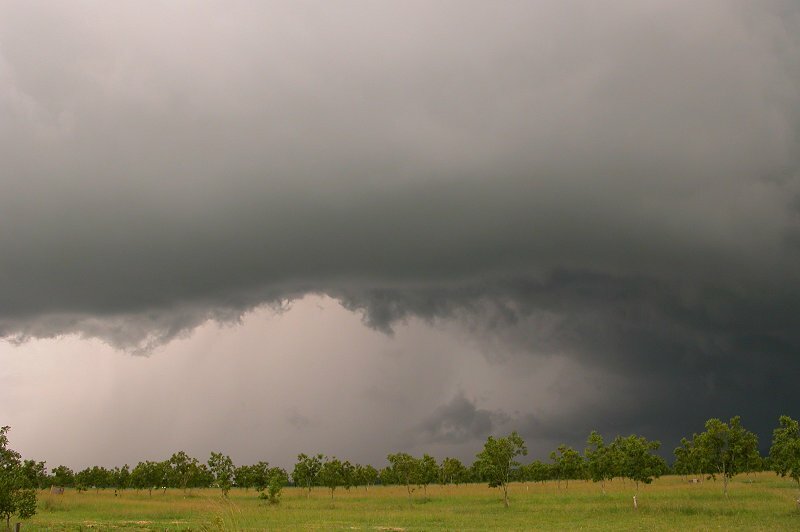 There was great low level turning, so supercells looked possible. There was plenty of low and mid level moisture before drying out above 500 and there looked to be quite a strong cap which would suppress activity until late. 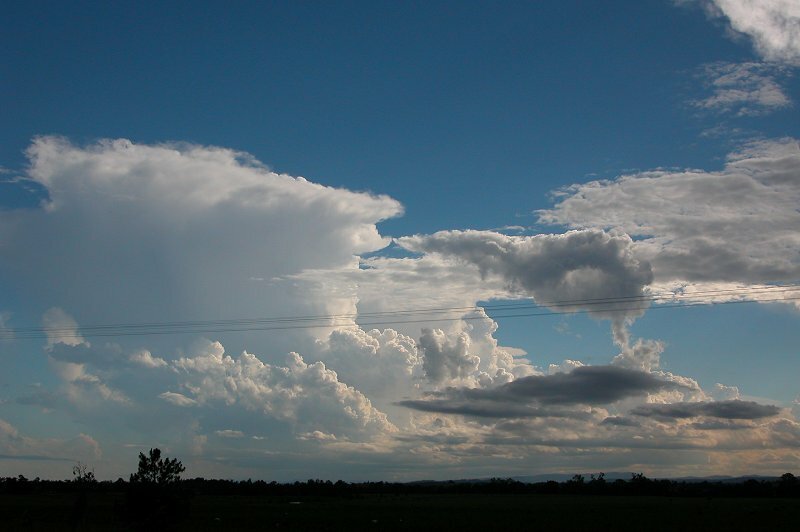 Severe storms developed in the Hunter by mid afternoon, as well as some weaker activity on S QLD, but the Northern Rivers remained clear of any convection. 5pm came and still nothing in the Northern Rivers. 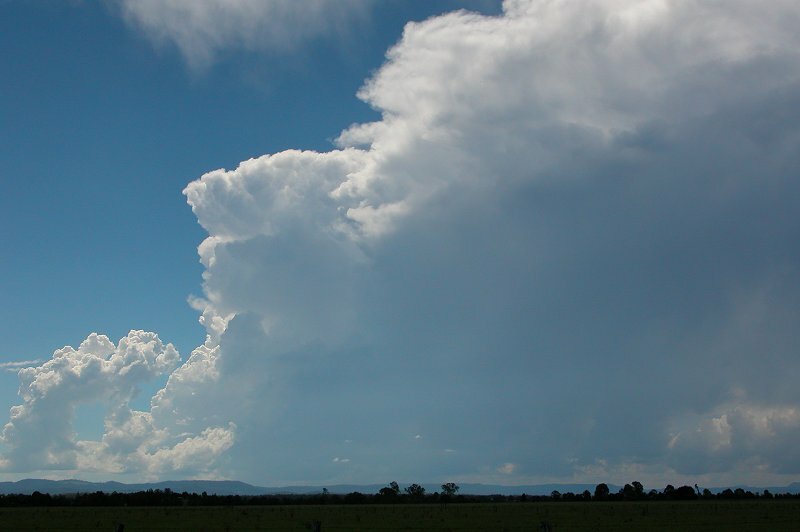 It was starting to look a little doubtful, however some solid convection soon got underway NE of Warwick in QLD. 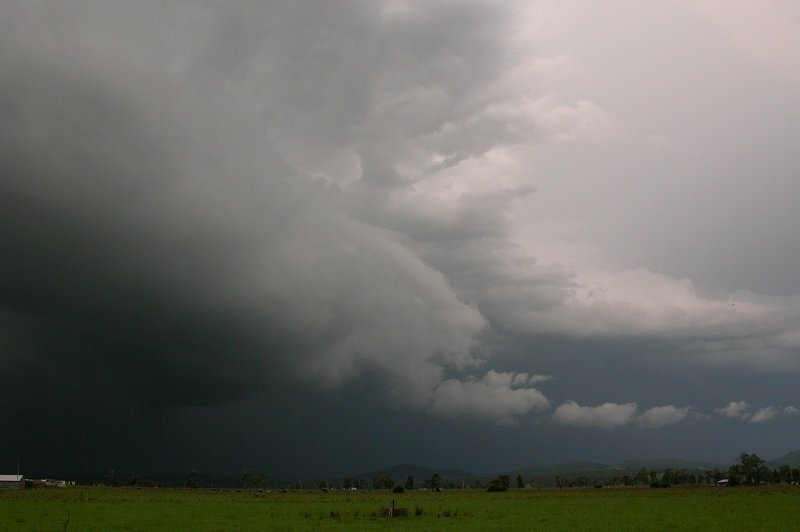 It was heading SE, and although it was a long shot, I had held hopes it may cross the border and track down into the Northern Rivers. This wasn't to be....but something even better happened! 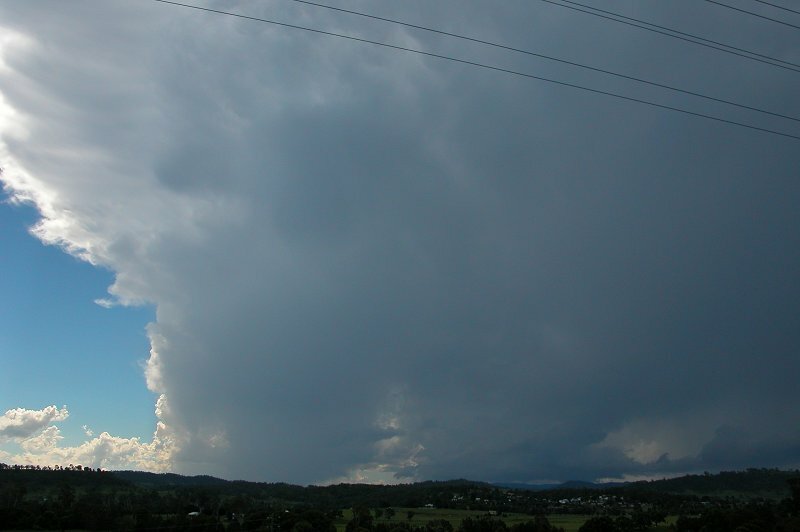 Around 5.15pm Michael Bath spotted a solid updraft going up to our WNW - out west of Kyogle. 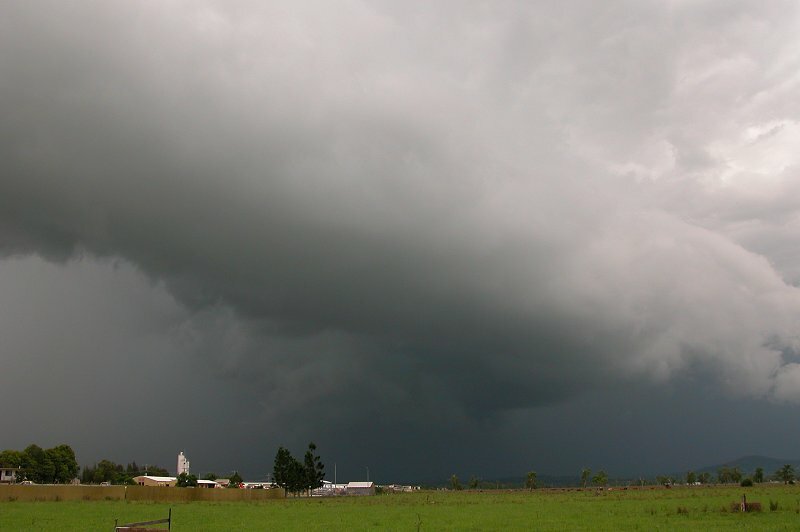 It looked weak on radar for a few frames but by 6pm radar showed a growing, strengthening storm. 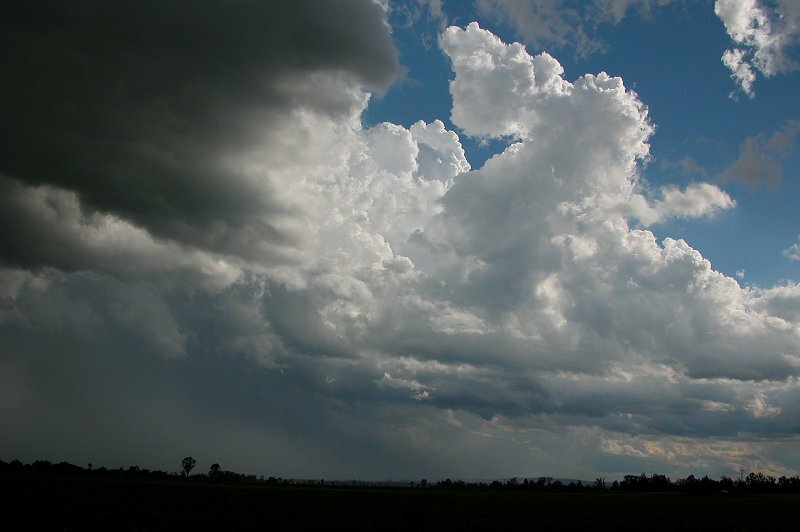 Some mid level cloud obscured the storm so there were basically no visual observations. 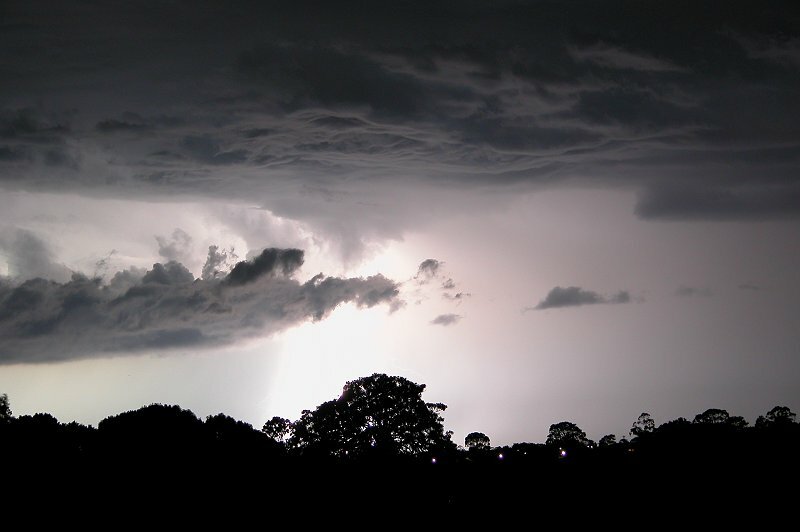 But at 6.10pm after I'd had tea I heard some thunder. 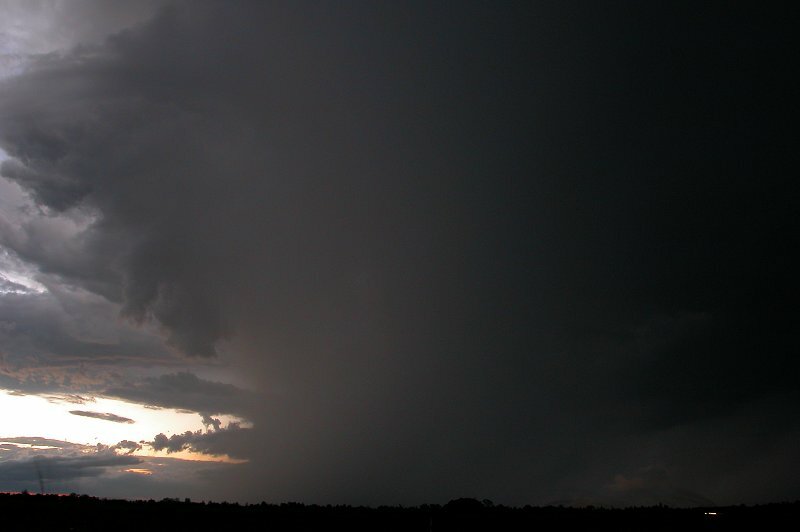 I checked radar and it showed the storm had split, with a left and right mover. The right mover was heading for Casino, so I was out the door like a shot! 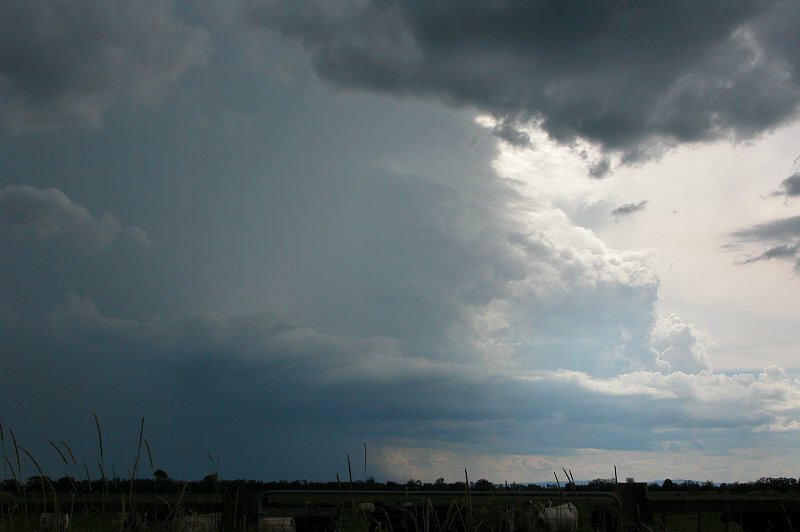 The lowering sun meant I couldn't pick any structure other than a nice solid anvil, so I was a little fearful during the drive west that it may be decaying (as many right movers do). 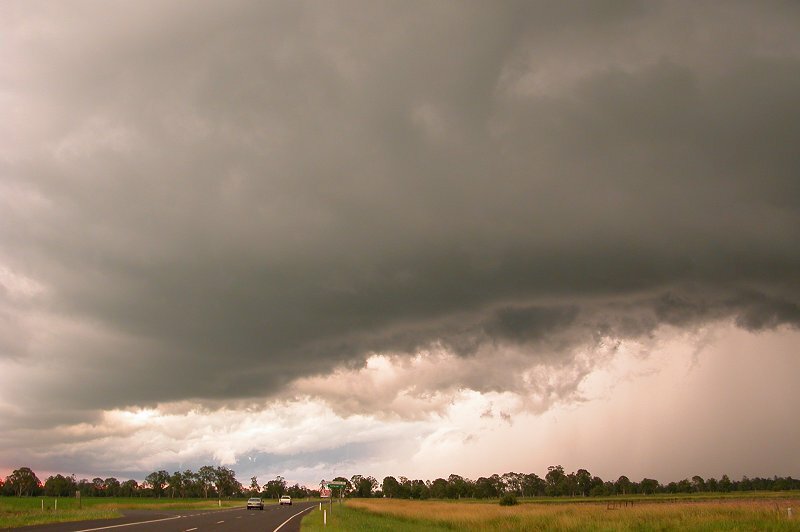 My fear of it decaying resulted in the decision to head to Kyogle from Lismore, figuring I could get to it sooner so if it weakened and didn't make it Casino, I could still see it close up. 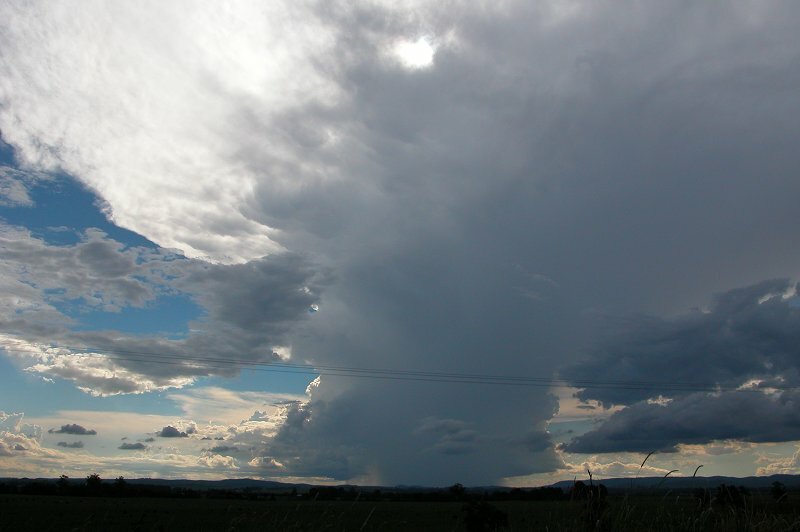 Shortly after getting out of Lismore it became clear to me this wasn't a weak storm! From here things kinda got a bit hectic! 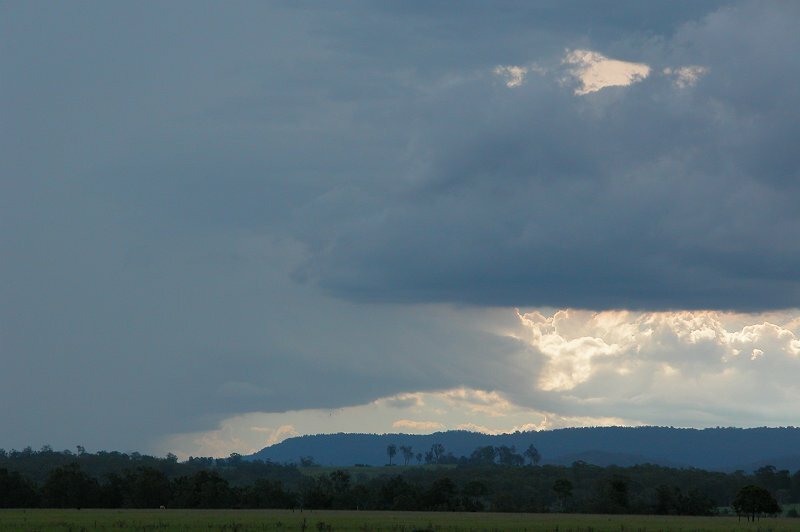 At 7.13pm as I got to the turnoff to Casino at about halfway down the road to Kyogle I pulled over for some photos. The scene was quite spectacular! 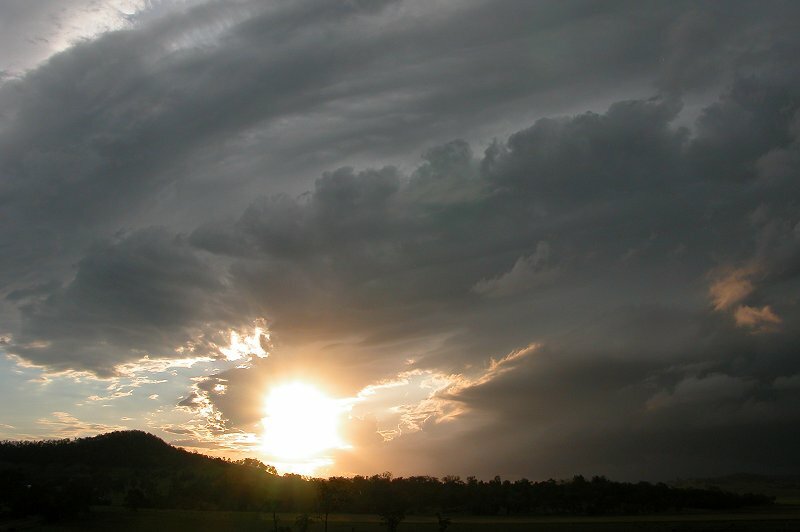 What looked like curved gustfront/mesocyclone was to my WNW and it was so dark underneath it, partly because the setting sun was shining on it and in my eyes. What made me wonder about rotation was that mid level cloud was curving around the updraft region - it's hard to explain and was hard to photograph as it was almost overhead, but hopefully it's noticeable in the photos. 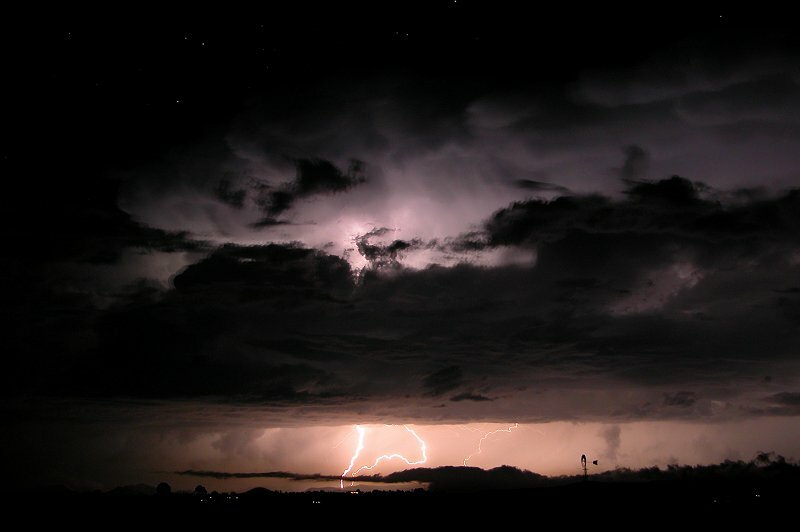 Frequent CGs and constant, deep thunder was occurring. It was clear this thing was racing towards Casino, so I shot down the road which heads SW into Casino. I stopped a couple of times along the way to photograph the structure which was on my tail. 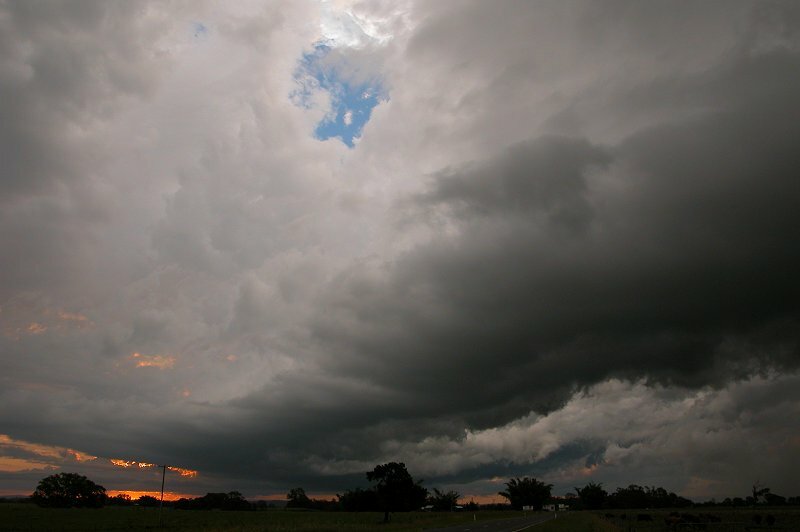 What originally looked like a meso looked more and more like a gustfront pushing out ahead of the rain. 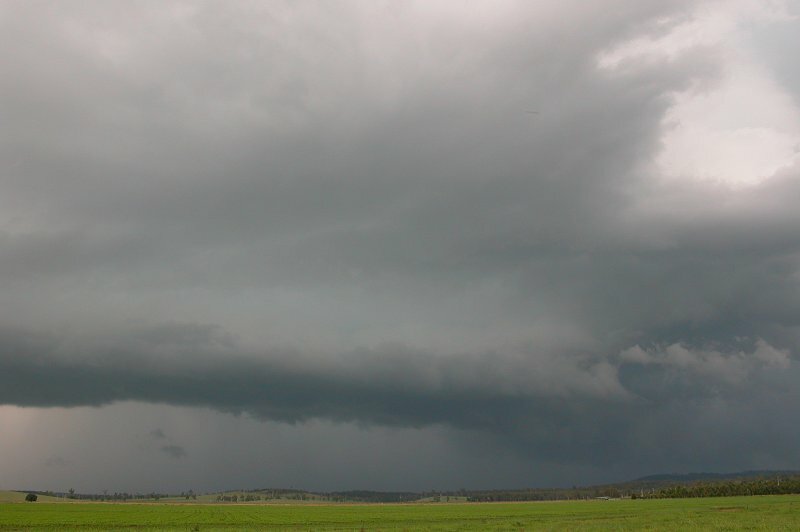 Radar confirmed that the cell was in a weakening phase from the time I got to Lismore - previously it had a nice solid red core and looked well organised on radar but now looked to be falling apart somewhat. 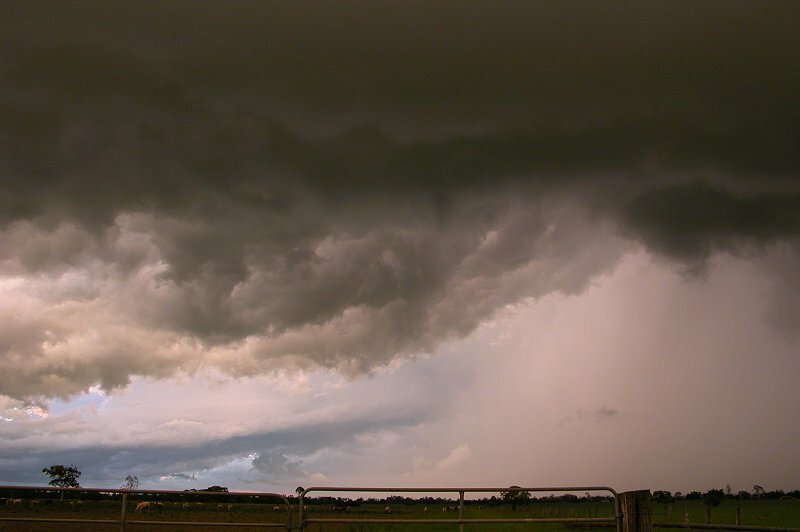 What was interesting was that no outflow winds were observed. I raced into Casino but there was one problem....I'd never been on the road I took before and I had no idea where abouts in the town I had come out! I figured I'd just keep heading S until I found something familiar. Sure enough I found the main road which heads towards Lismore and so I turned down there and began my dash east! The storm was literally just outside Casino. 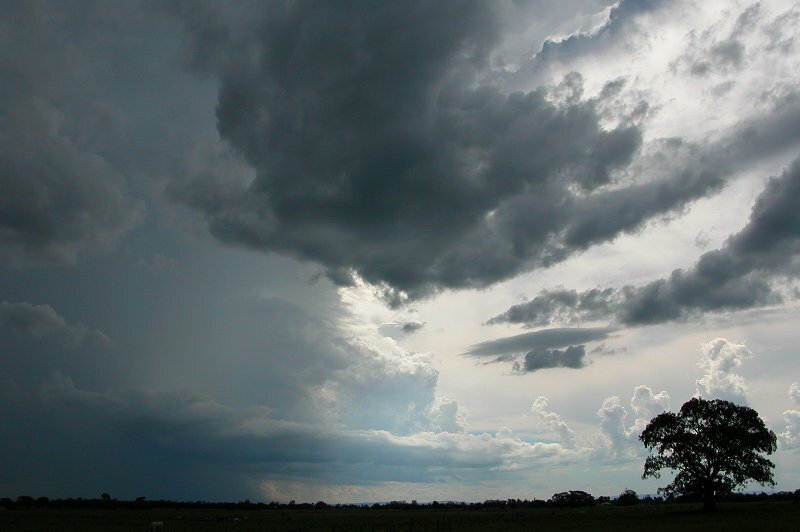 Strong storms were also visible to the far south and was later revealed to be a possible supercell. 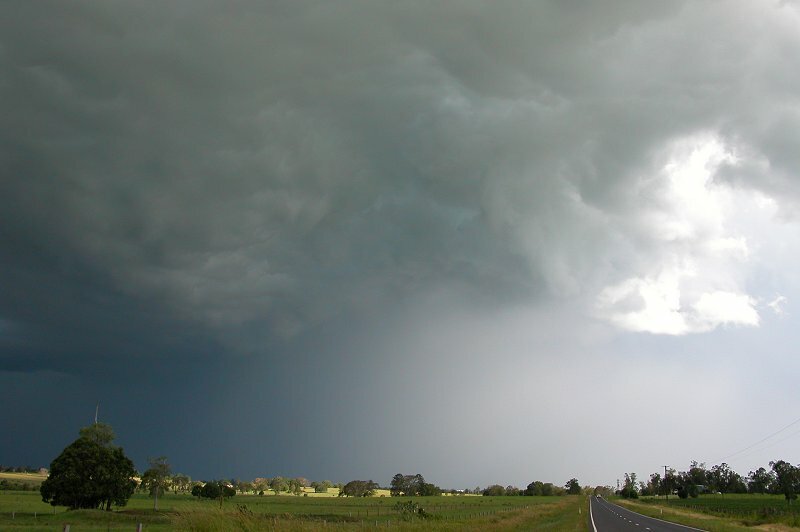 I somewhat reluctantly kept heading east - uneasy about the storm which looked like it was going to get right on top of me....in my new car (which I wasn't so keen about getting dented so soon)! 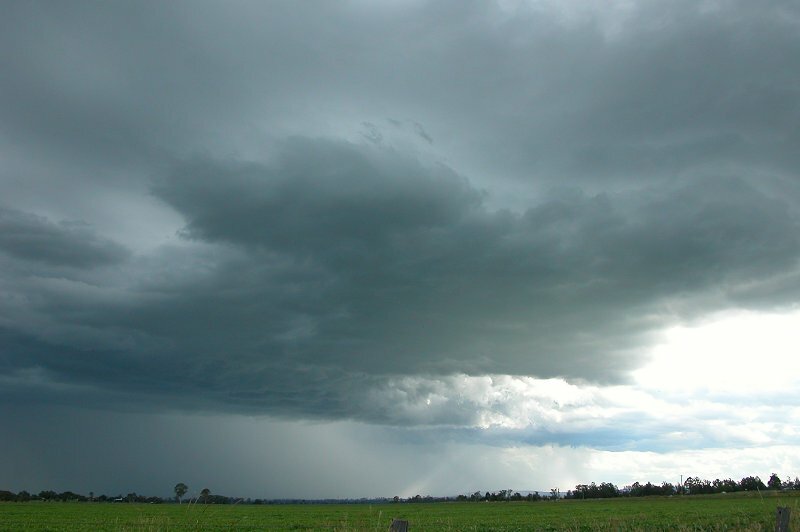 I stopped twice as I was heading east - observing a very dark precipitation area just N of me. Frequent CGs were still occurring. 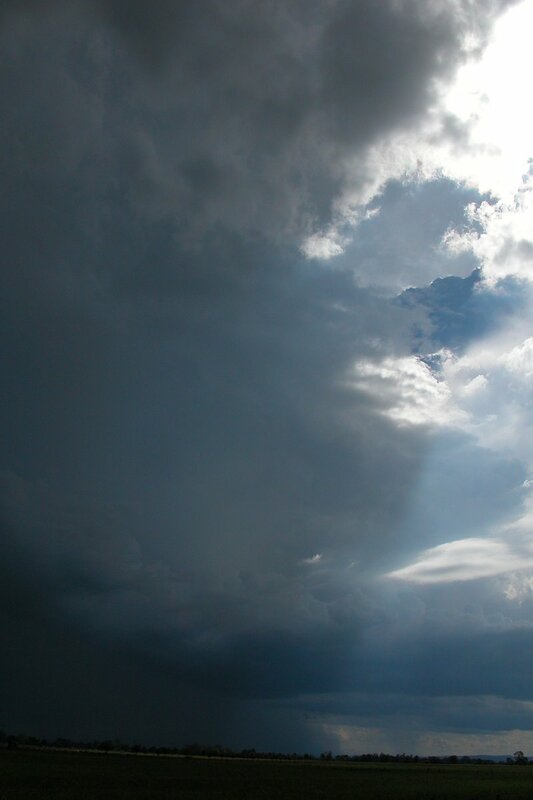 The storm appeared to have intensified slightly visually and this was confirmed on radar. Not long after I took the last photo in that sequence and continued east slightly, a hailstone which looked around 3cm in diameter dropped in front of the car!! Hail was being thrown out ahead of the storm! 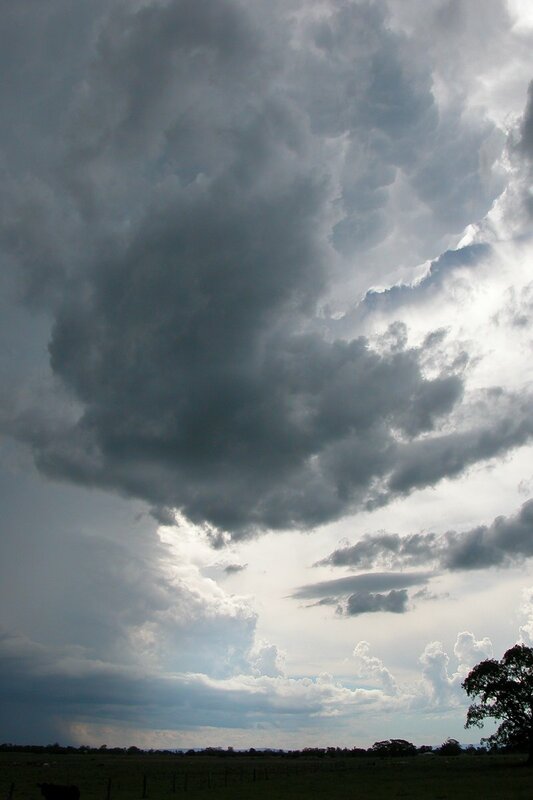 I quickly shot down Fig Tree Lane, which takes you a little bit S, hoping to avoid the worst of the storm. 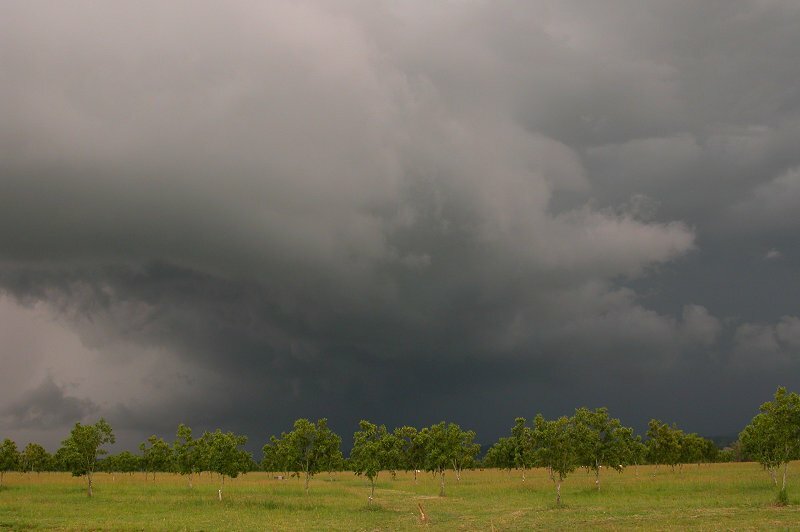 A few stones, around 1 to 2cm were popping out in front of the storm, along with a few large drops of rain. I soon came to the end of Fig Tree Lane and pulled over. 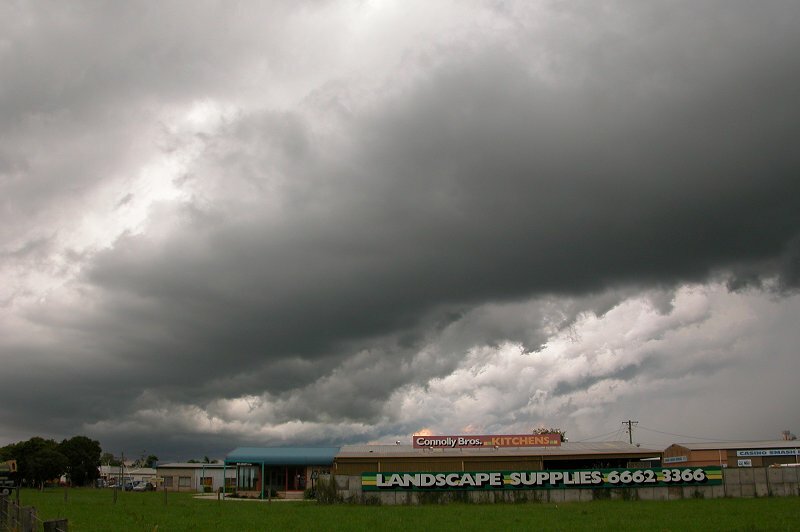 I was a little concerned I was going to cop a whole heap of hail but there wasn't much more I could do. 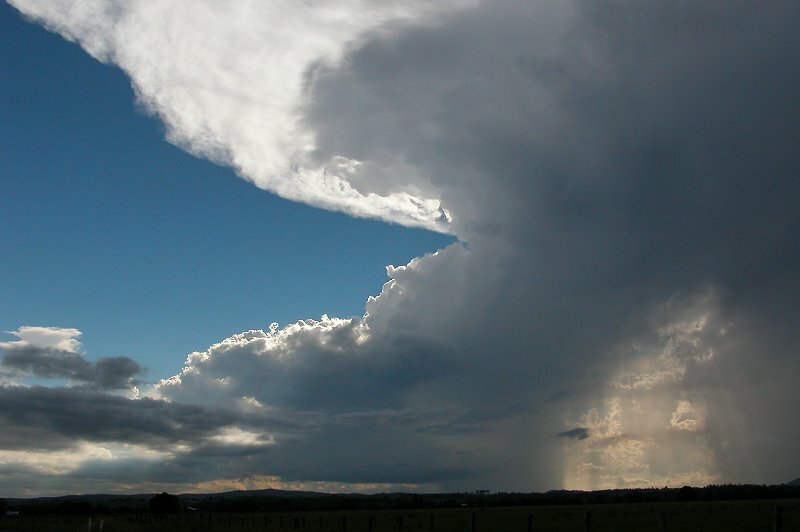 It did appear though that the core of the storm was now going to pass to my NE. 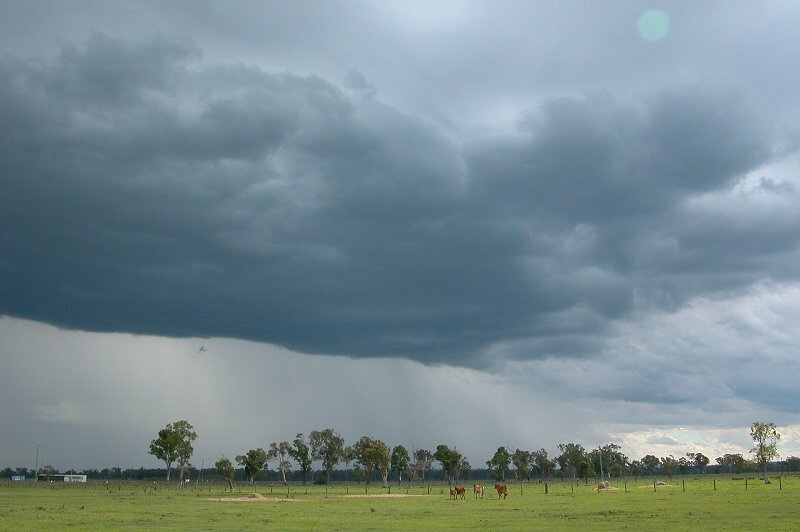 It was now 7.45pm and I was starting to get a bit of rain. 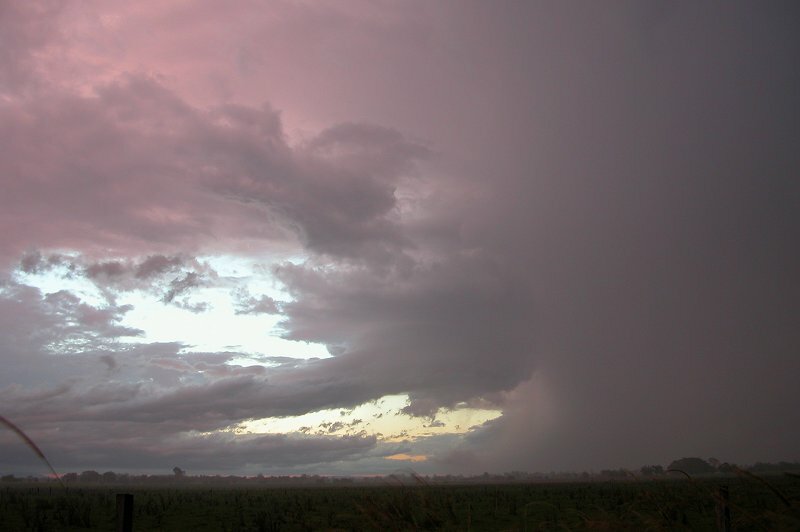 A radar update revealed the storm had gone red at around 7.30pm but was now weakening. 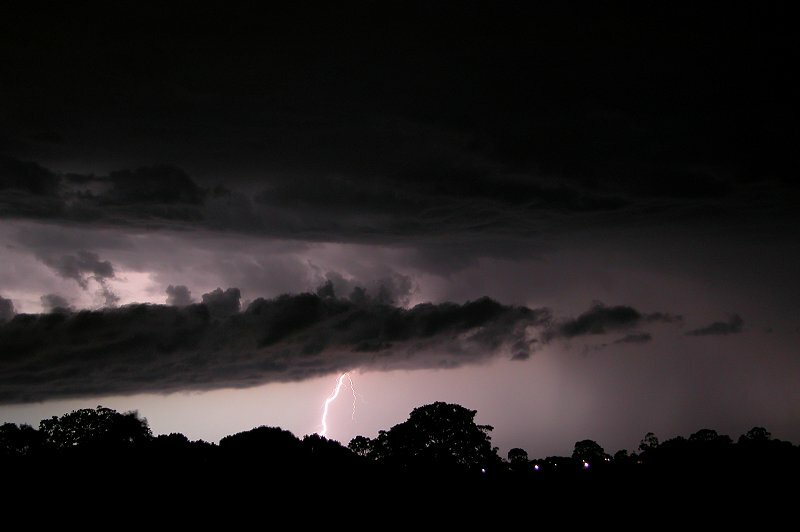 This was also evident visually, but the storm was still producing some nice bolts of lightning! 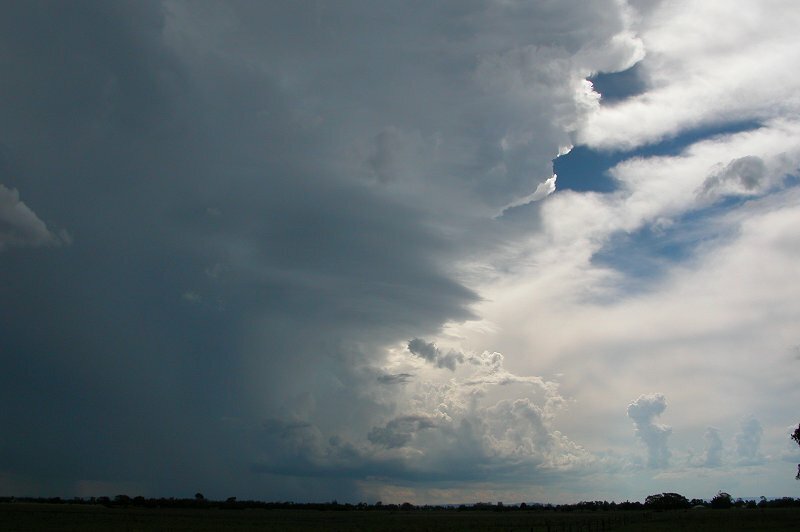 After getting some heavy rain, it started to ease and new storms forming behind the first cell were revealed. 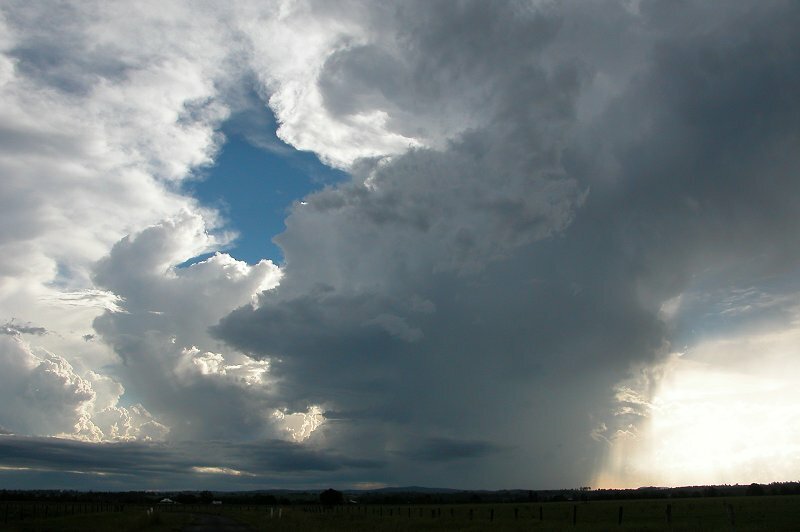 The cell to my WNW was quite interesting - it had cloud feeding into a nice rounded updraft, but it was quite high based. 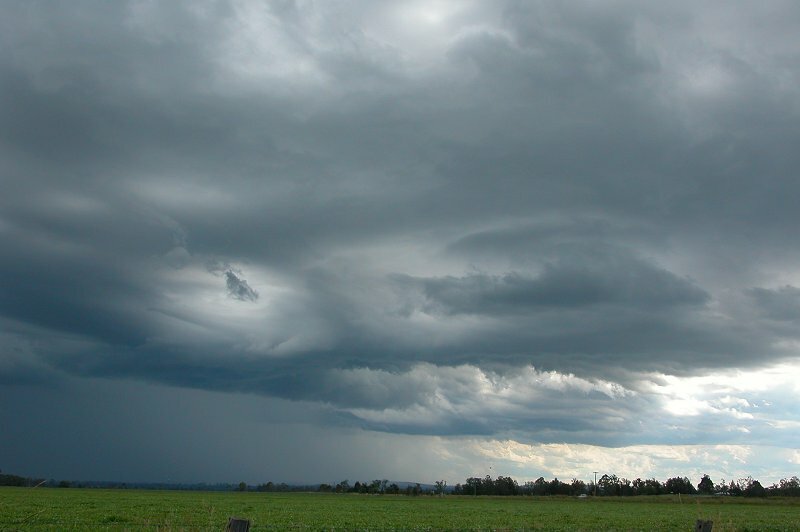 I kept on eye on this feature, however it quickly weakened. It still maintained a nice rounded look until about 8.05pm before falling apart. There was now frequent lightning from the cells in the northern half of the sky, but more importantly, lightning active cells were popping up to my south as well! 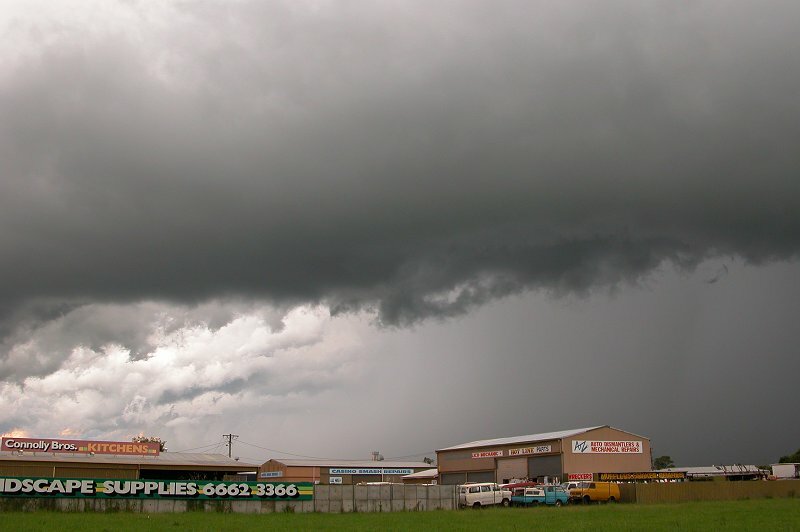 I had to make the call whether to head for Coraki and try and intercept a possible supercell heading up from around Grafton way of stay near Casino, out of the activity, and get some lightning photos. 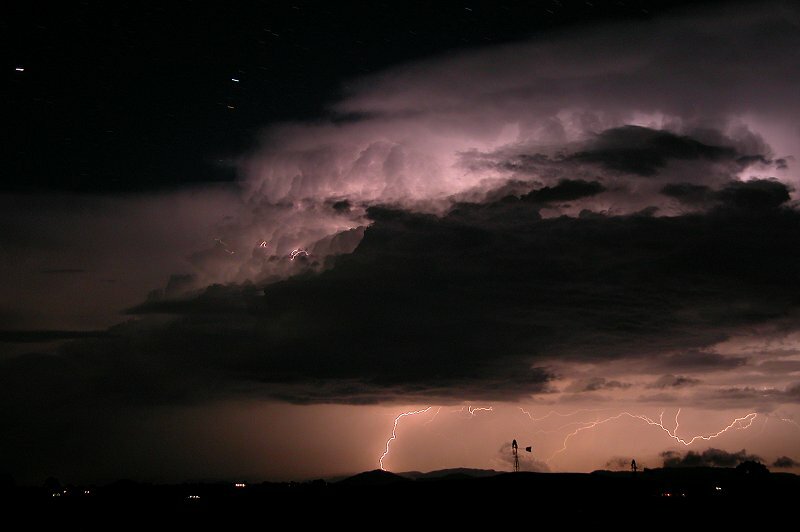 I decided to stay in Casino, and so after refueling I headed just N of the town and setup the camera to enjoy a brilliant lightning display both to my N and S! 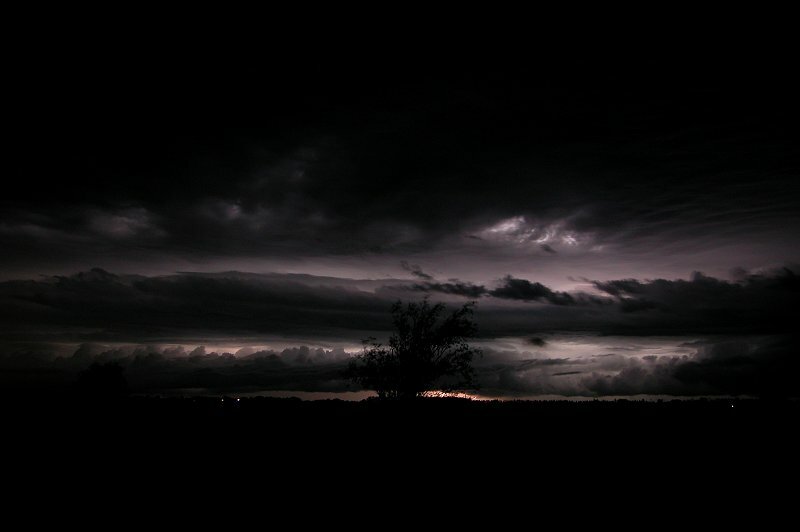 I headed home at around 10.10pm as the storms to my S were getting much too close. 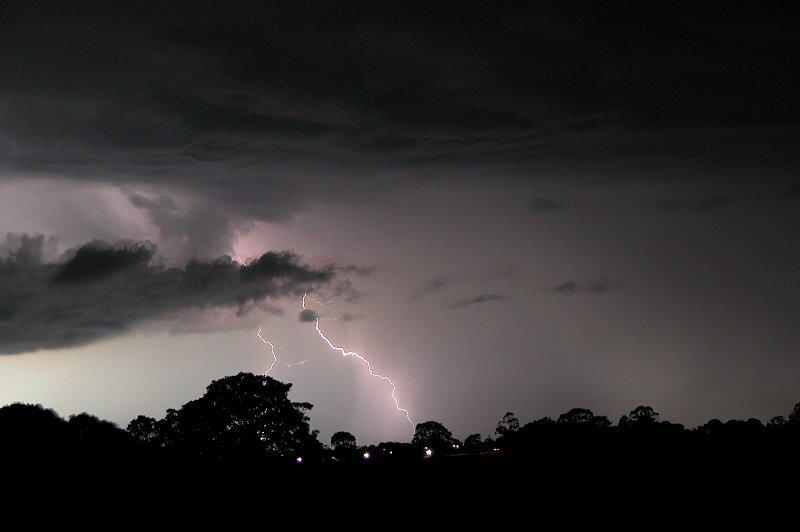 I enjoyed lightning just S of me the whole trip home, with some incredible CGs flashing ahead of the rain. Also quite amazing was the way the inside of the storm would light up an intense green colour when in-cloud lightning occurred. 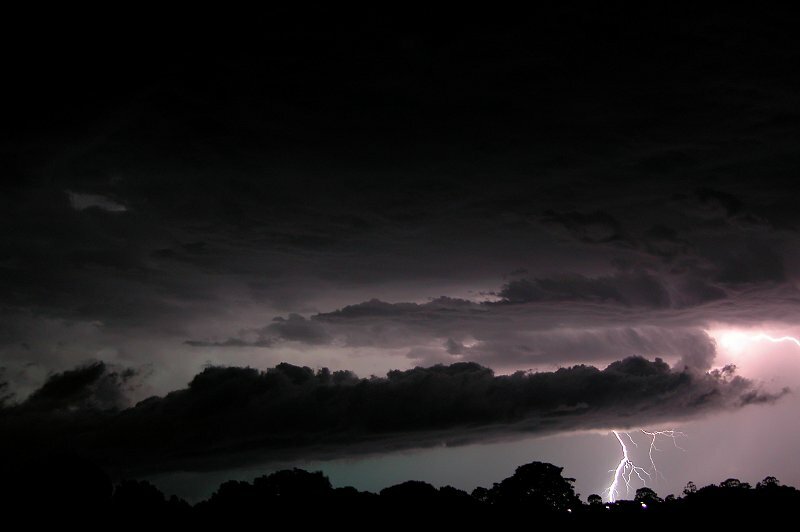 It looked quite nasty and reminded me of some wild storms we had late at night in summer as a child. 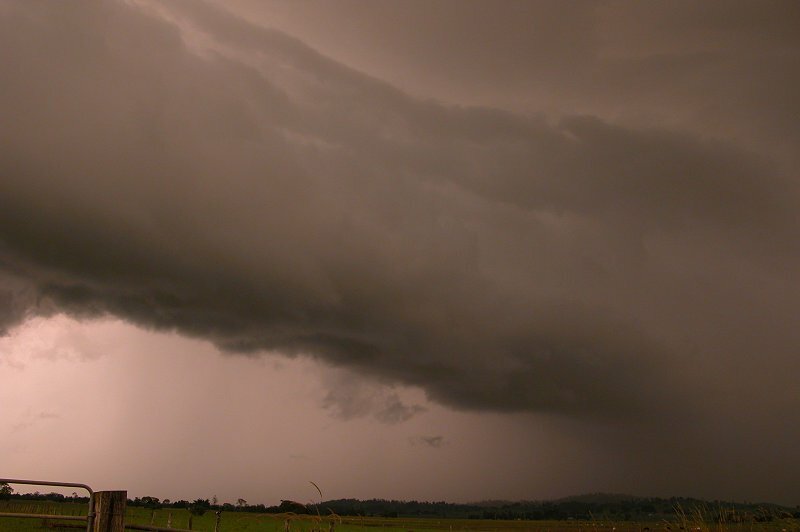 I got home at about 11.00pm and experienced very strong outflow from the storms to my ESE, which were off the coast . They were giving off several flashes per second, with the occasional CG, so I grabbed a few more photos before calling it a night at 11.20pm. 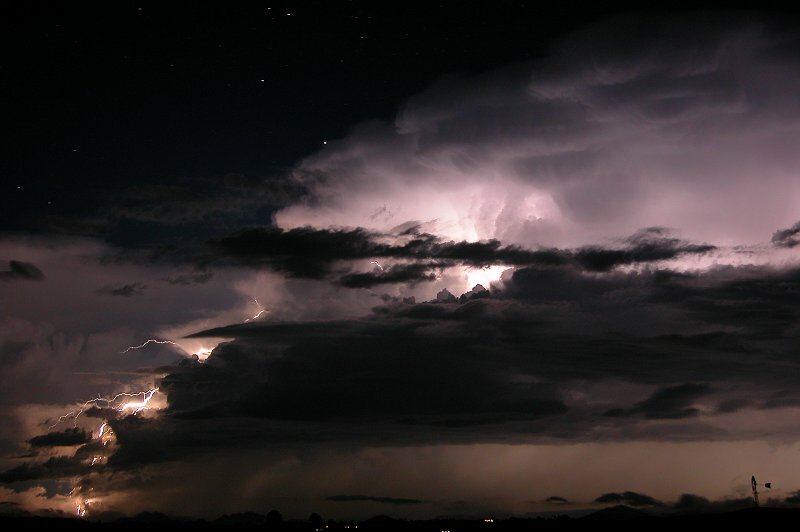 More storms developed and moved into the region during the night, however I slept through these as I was so exhausted! 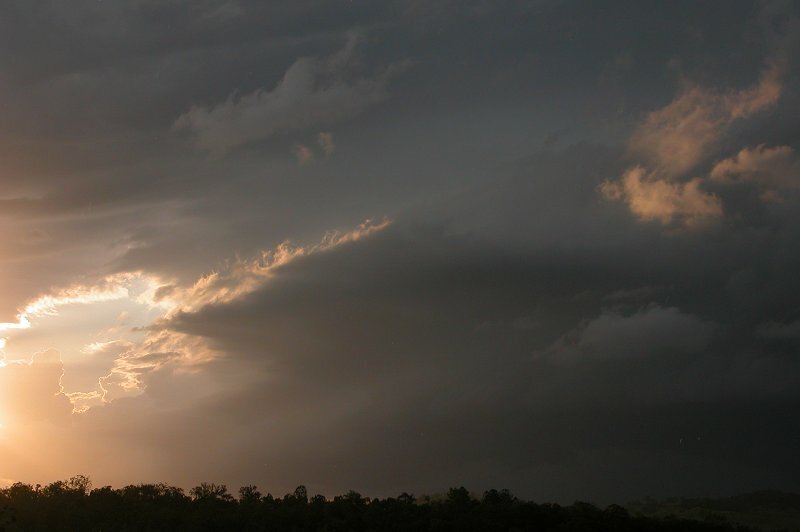 It had been an amazing evening - and was the best chase of this outbreak to date. I'd been hanging out for a good light show all summer and I'd finally gotten it, along with some awesome looking activity before sunset, so I was also able to enjoy some structure! 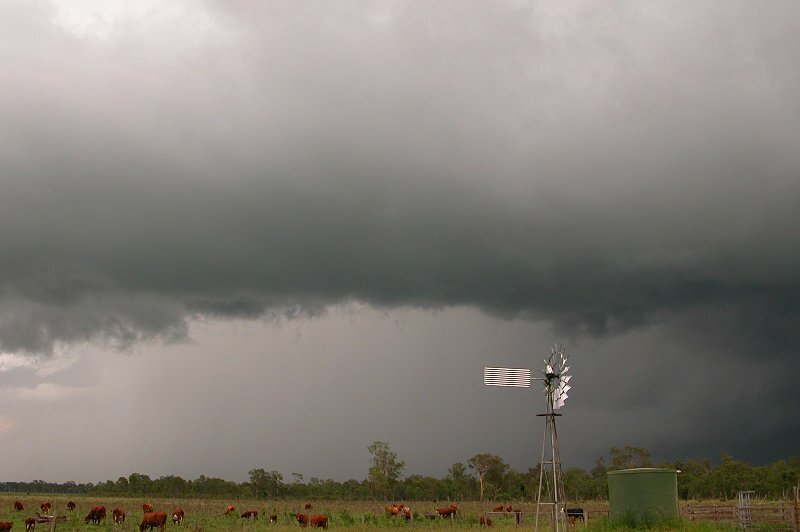 Another 3 days of storms were to affect the Northern Rivers, so check out part 3 of this outbreak!